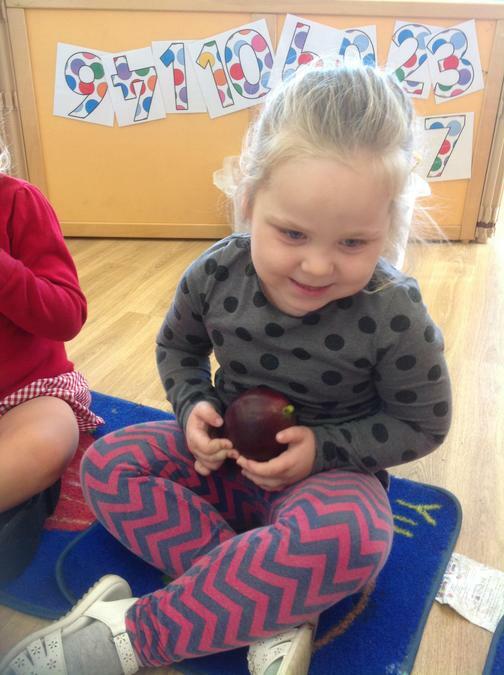 Thinking about healthy teeth. 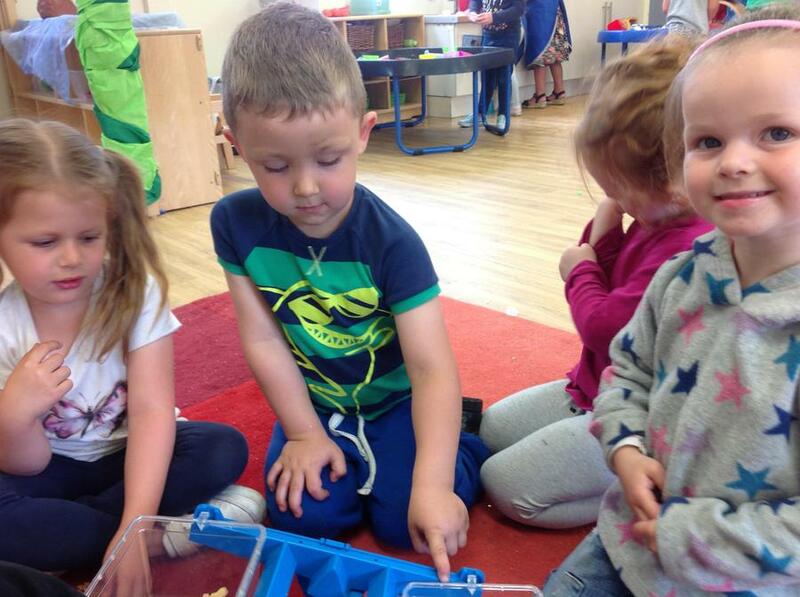 We played a game where we have to roll the dice and cut out a set amount of teeth. 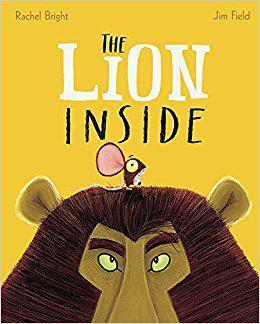 This term we are reading 'The Lion Inside' and we shall we learning lots of different things about Lions and jungle animals. 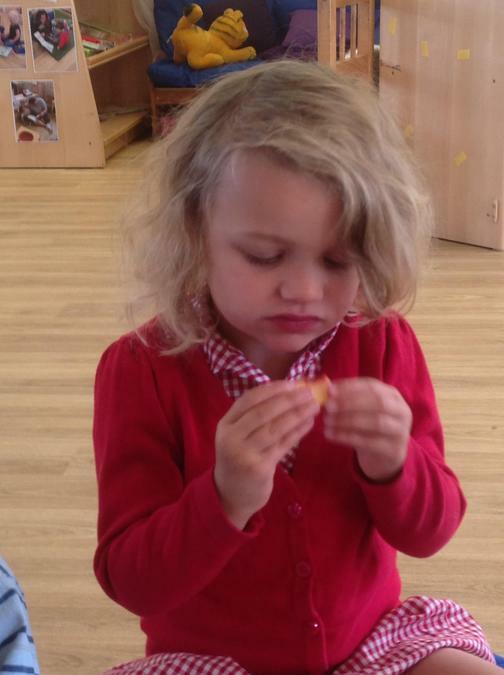 Welcome back after the Easter break, we hope you had a fun and restful couple of weeks. 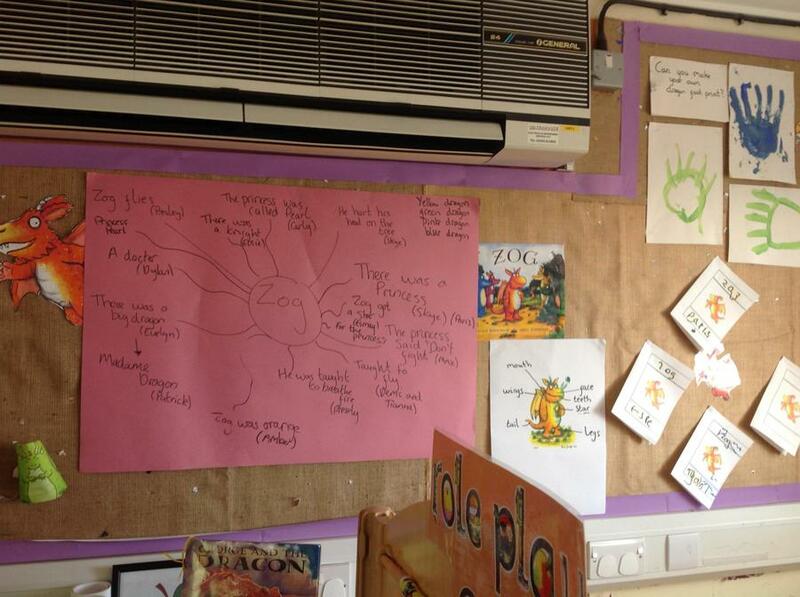 This term our topic is, ‘People who help us.’ To help us, we will be reading the book ‘Zog’ by Julia Donaldson. 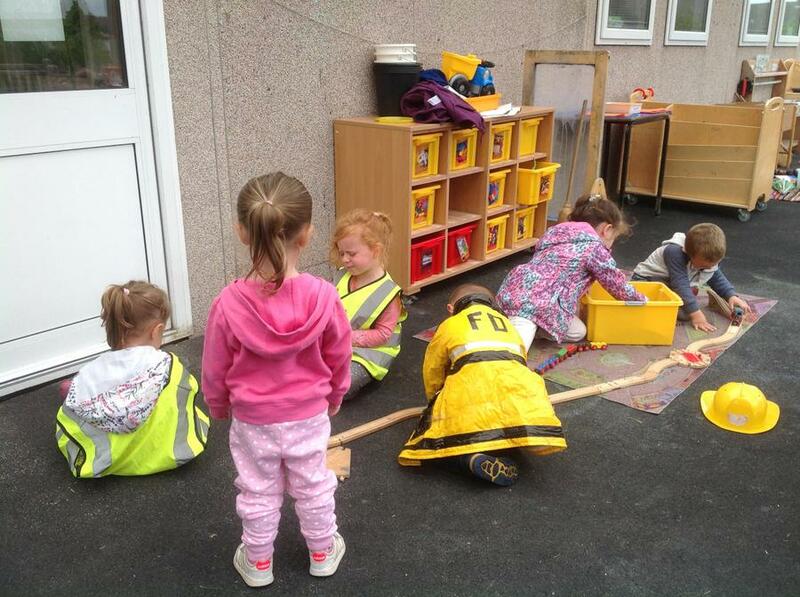 We will be looking at the lives of others and will consider the role of all those who are there to look after us. 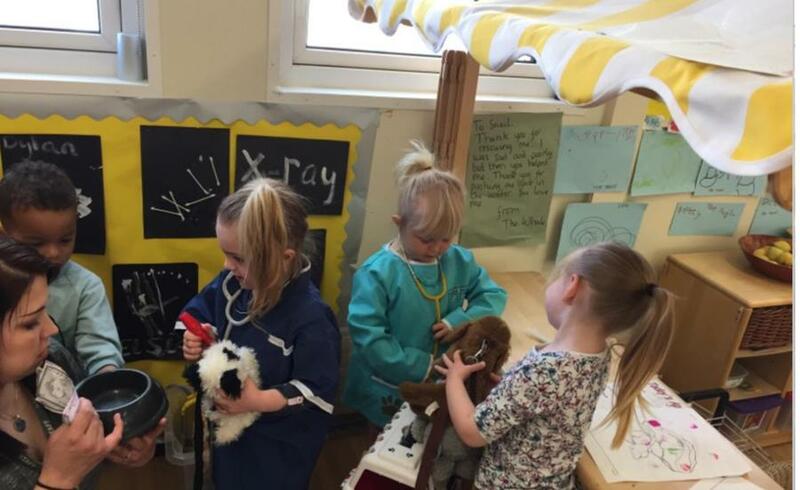 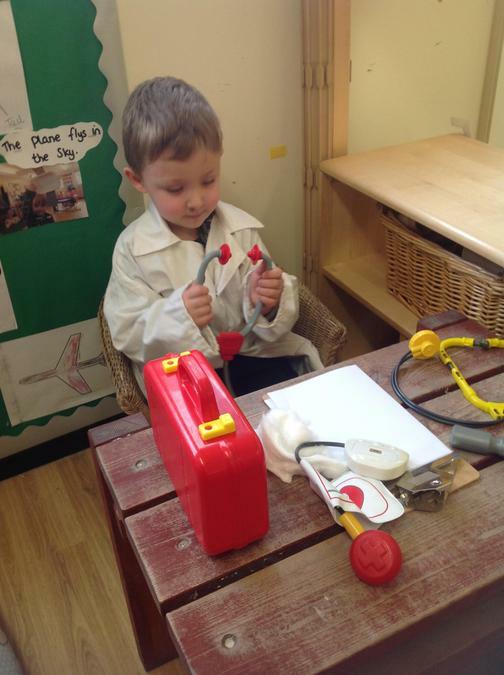 Children will also be learning to show an interest in different jobs and also different ways of life. 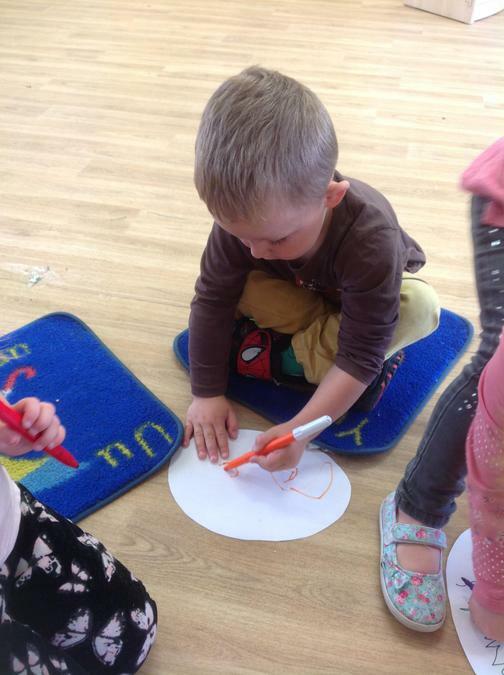 We will be continuing to recognise and write our name. 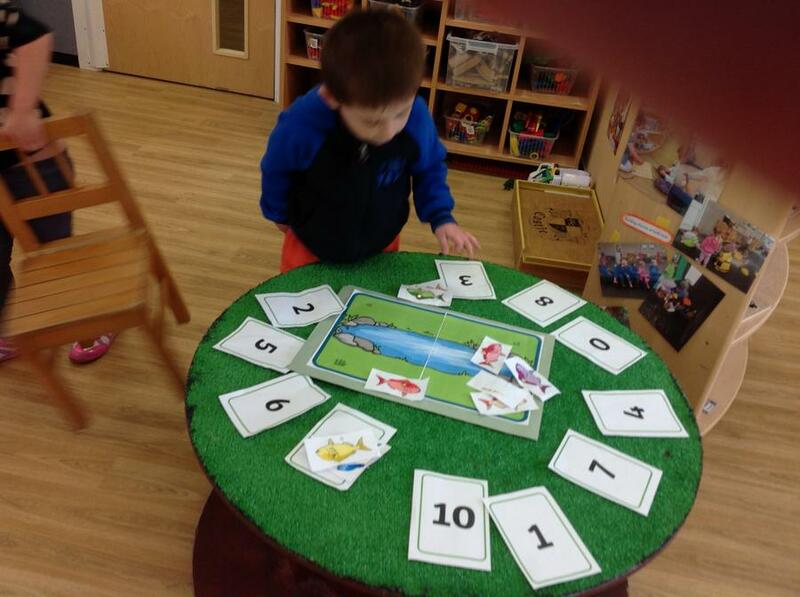 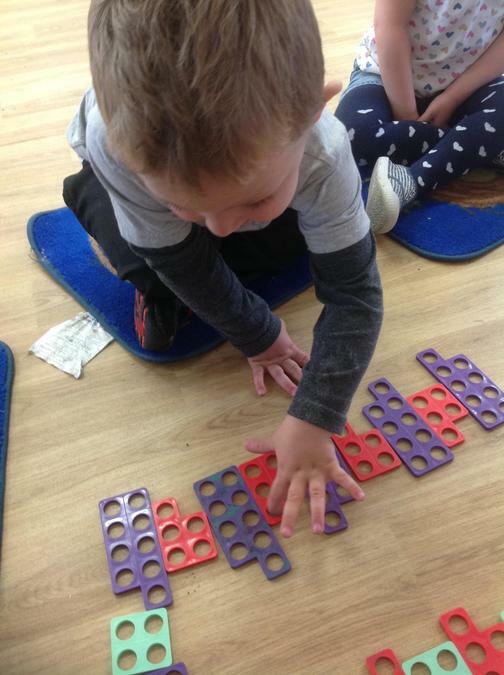 Furthermore, we will also be looking to count, recognise and write our numbers to 10. 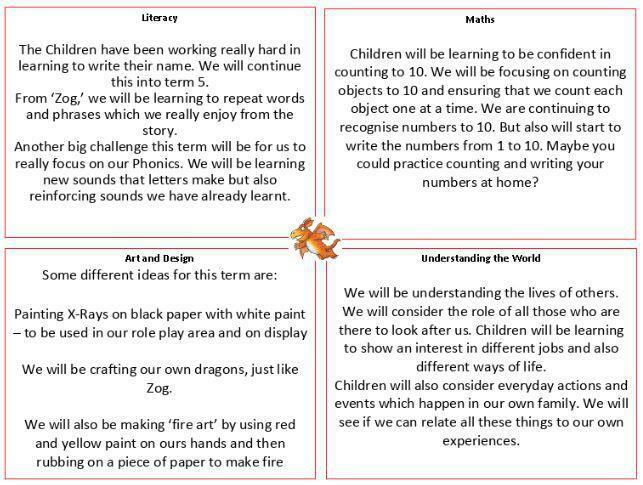 Another big challenge this term will be for us to really focus on our Phonics. 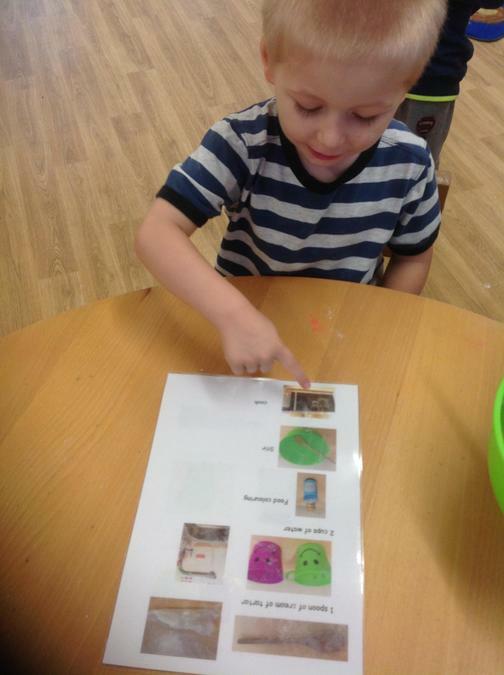 We will be learning new sounds that letters make but also reinforcing sounds we have already learnt. 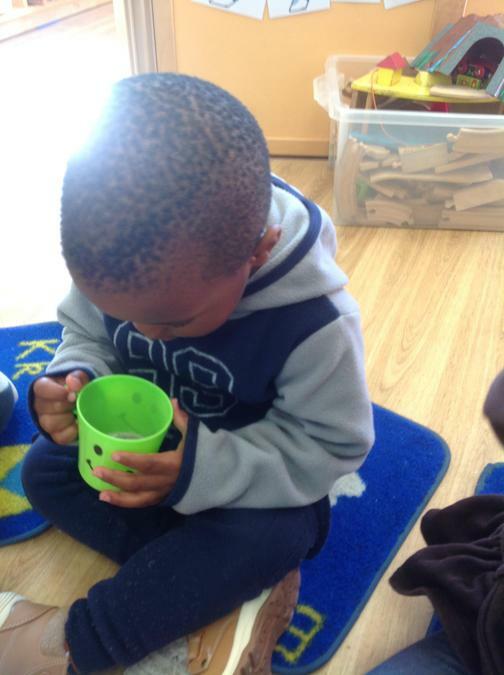 Please practice at home, it can make a real difference. 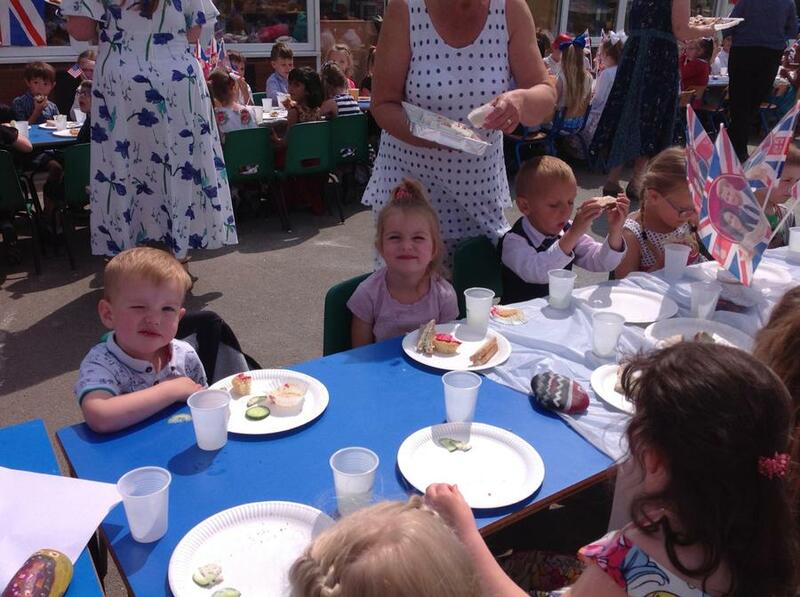 In week 6, we have been celebrating the royal wedding. 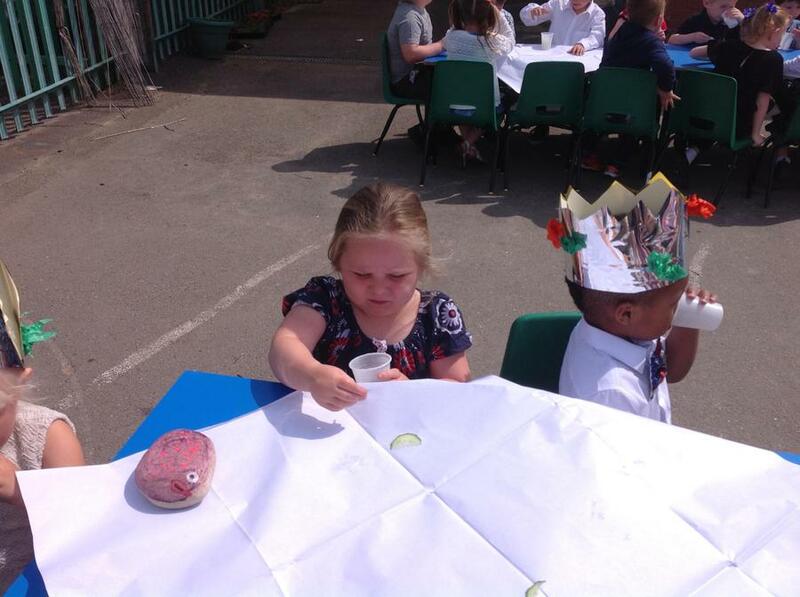 We had a lovely day, making crowns, eating sandwiches and raising a glass of lemon squash to Prince Harry and his wife to be Megan Mekle. 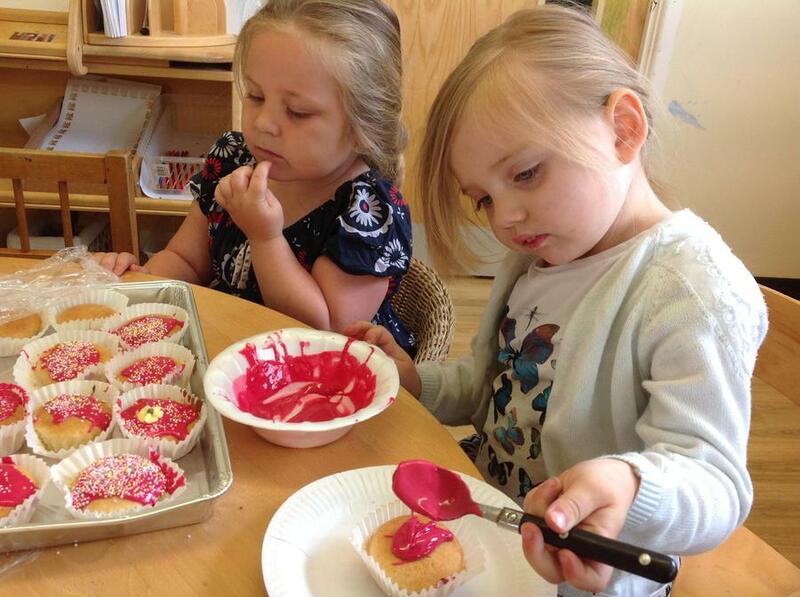 We also made crowns and iced some cakes in preparation for our tea party. 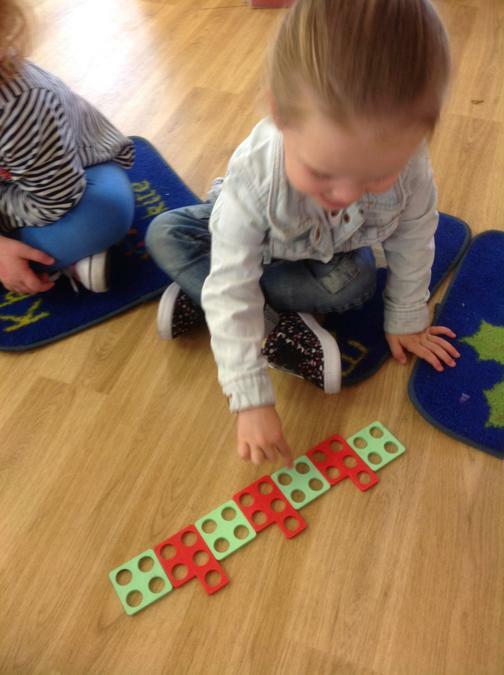 In week 5 we have been looking at matching the amount with the right quantity. 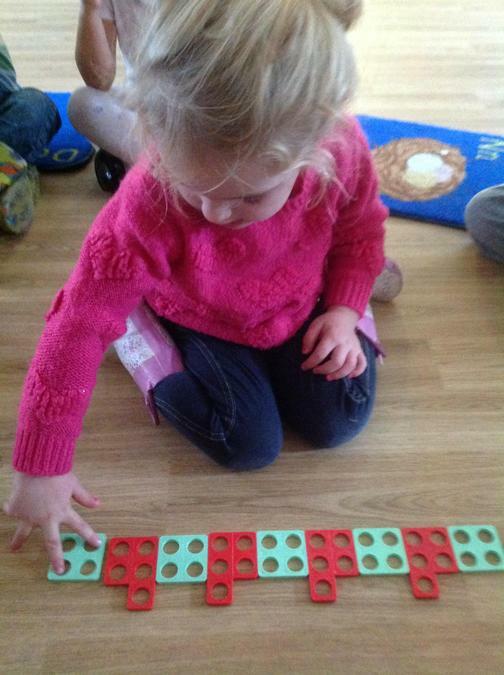 Some of us are becoming very good at recognising the different numbers. 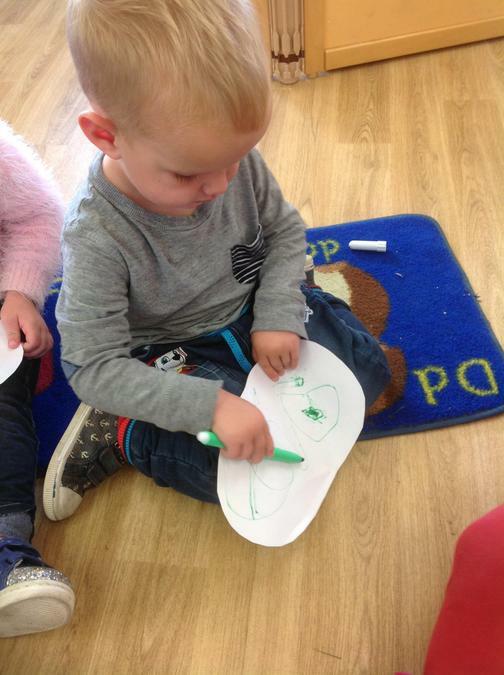 Over the last few weeks we have really enjoyed learning lots about Zog. 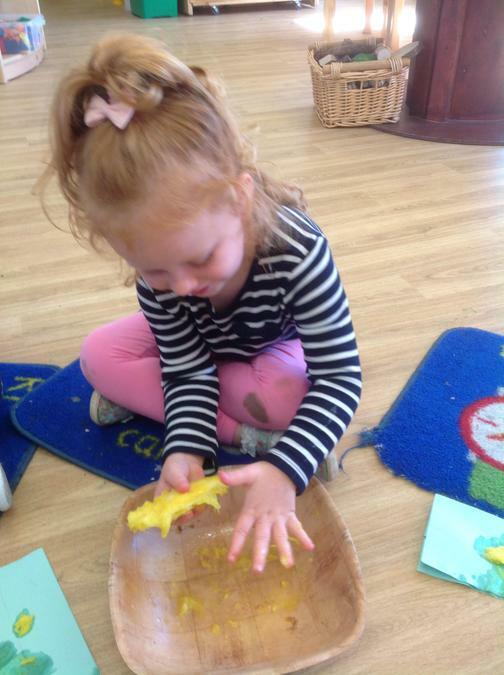 We have made dragon cones, footprints and even written our own booklets. 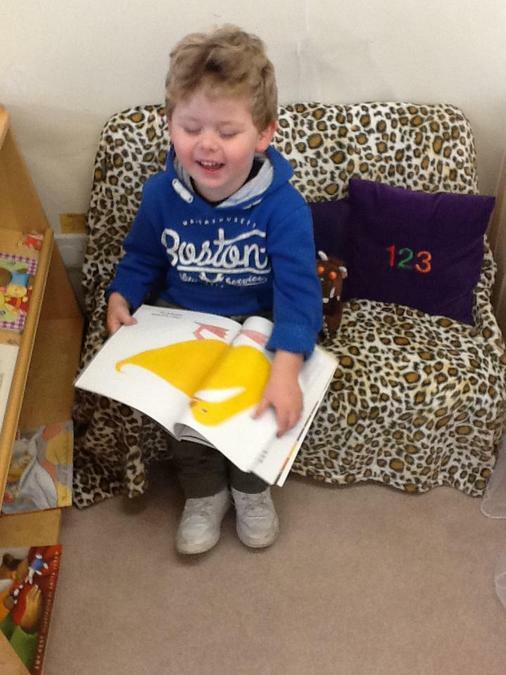 We have also began two other really exciting books. 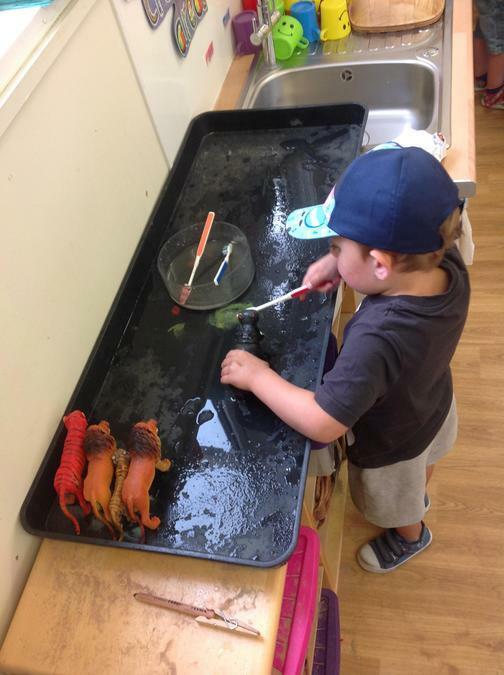 This includes, 'The snail and the whale' and 'George and the Dragon' We have been learning how to Ben vets so we can look after different animals and also completing different art work. 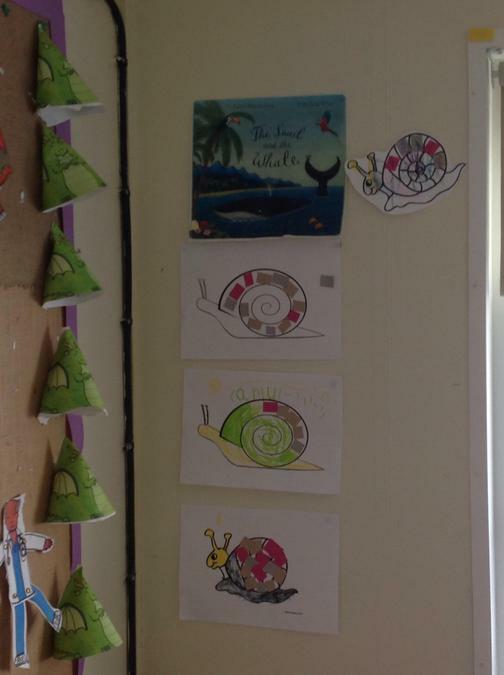 Including collaging a snail. 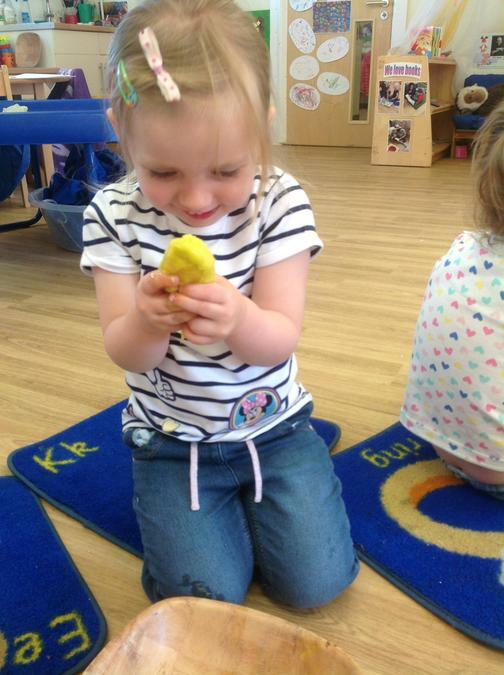 We were very lucky to have a visit from the Easter Bunny. 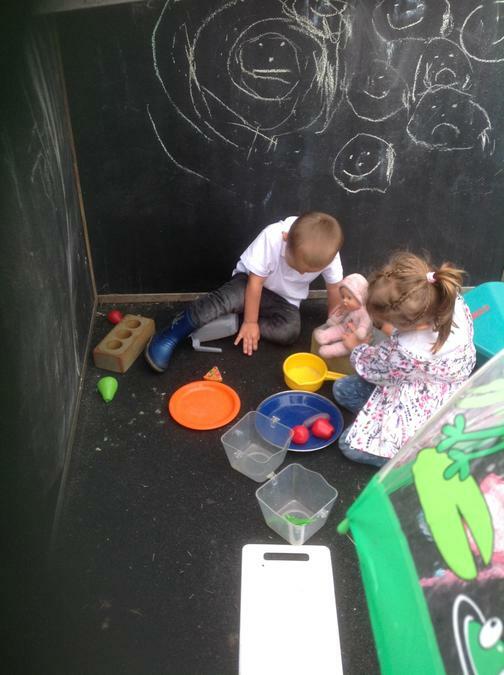 We had to explore the reception playground and see if we could find the eggs we had drawn. 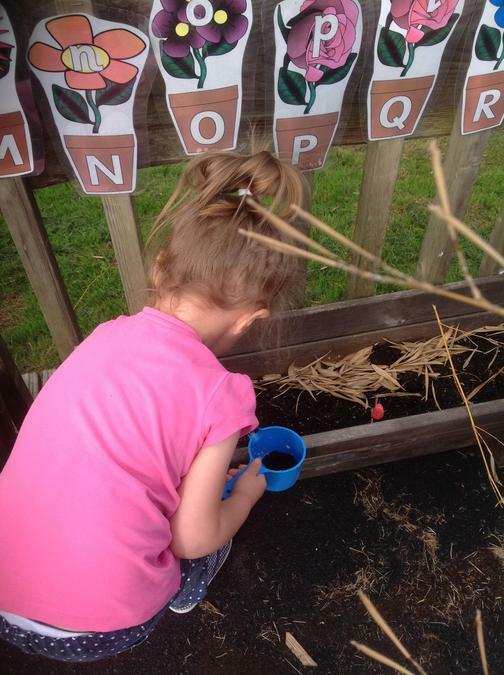 After the Easter Bunny gave us a delicious chocolate egg. 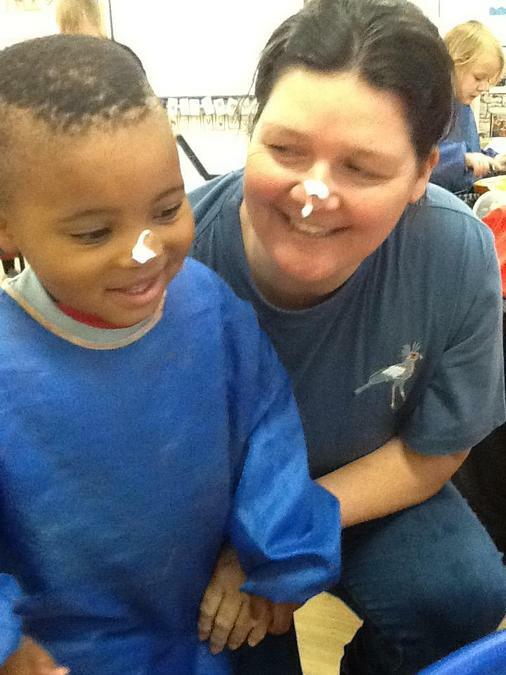 Thank you to all the parents who came and celebrated Mother's Day with us. 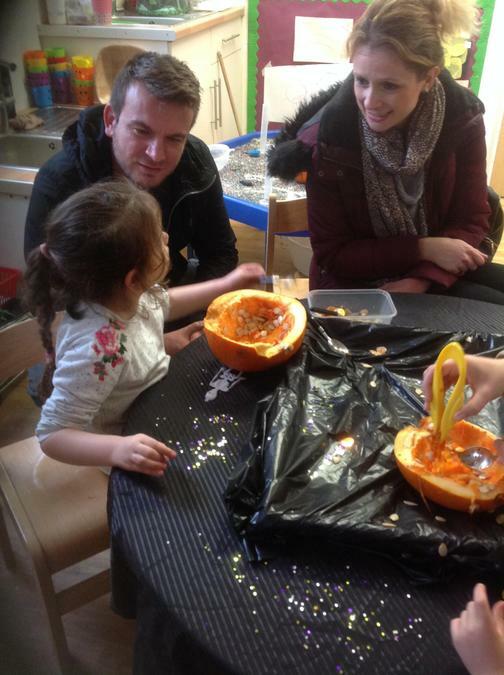 We hope you enjoyed decorating biscuits, painting and drawing with your children. 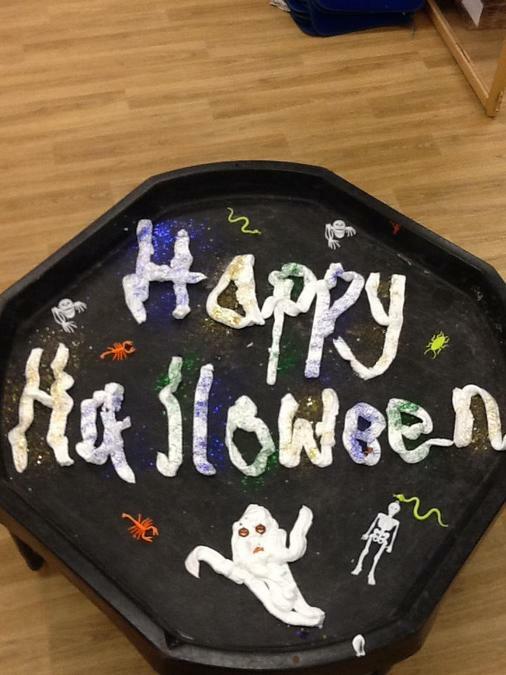 The children really enjoyed singing for you and making cakes for all the Mummys to enjoy. 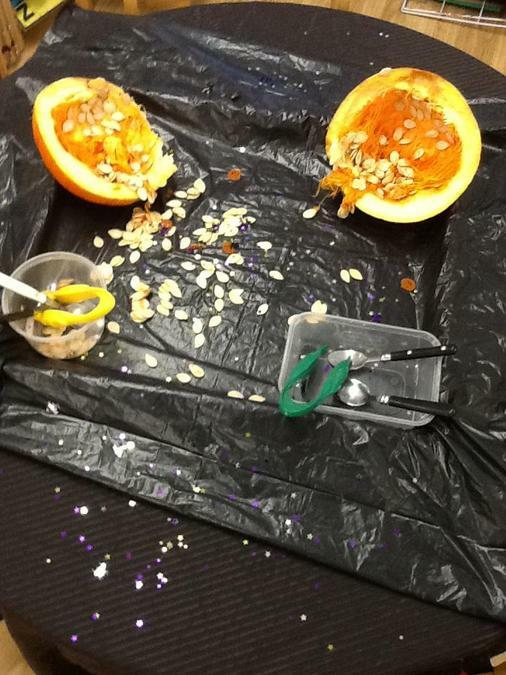 In this first week back, we have been having some fun with some porridge oats in our creative area. 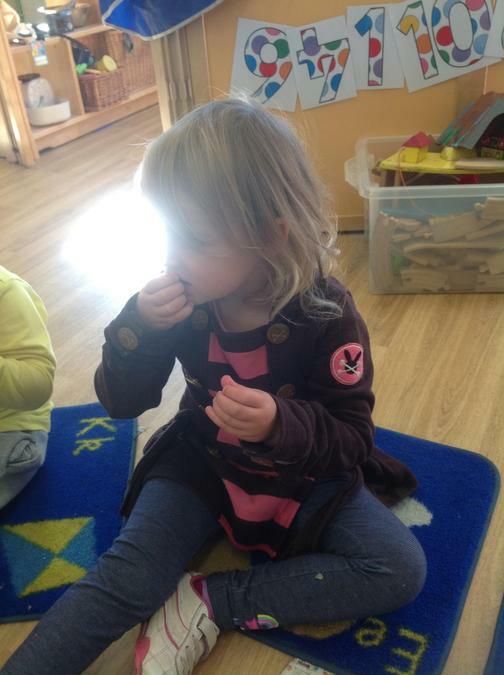 Also we have mixed some oats with playdough and cutting bear shapes from the playdough to try and retell the story. 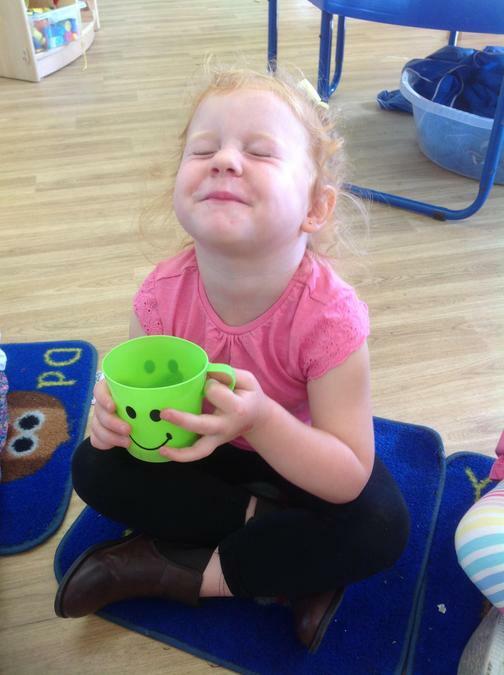 We have also been looking at mindfulness and our brain. 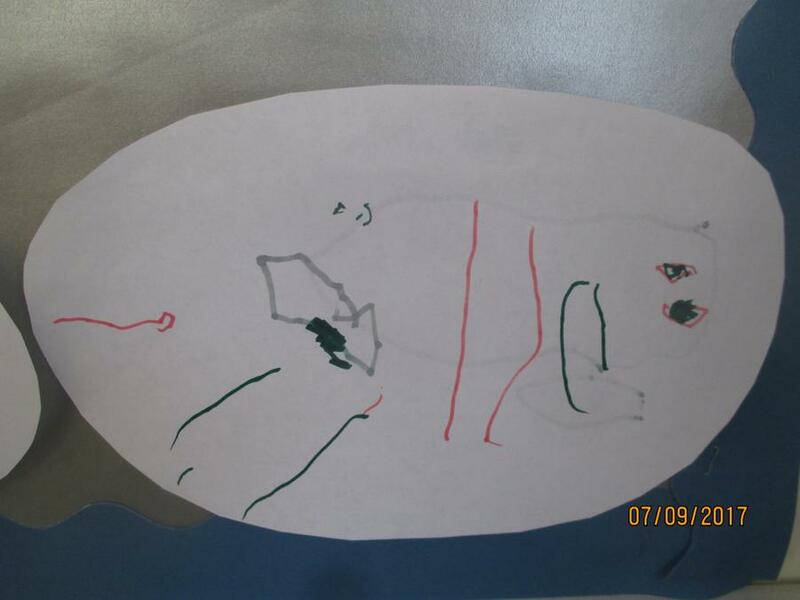 The children discussed where our brain is and what it does. 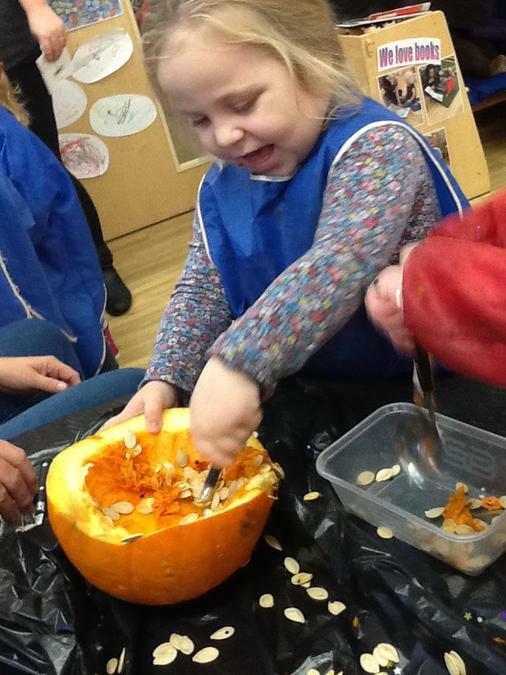 We used our hands to recreate the brain. 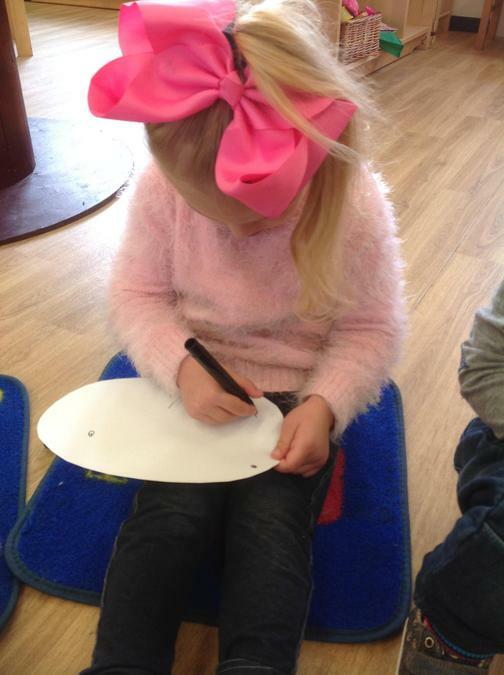 Today the children wanted to make their own story books. 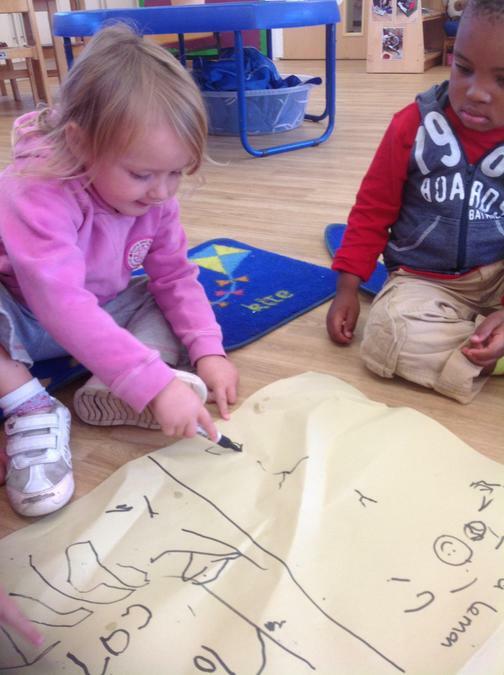 We discussed the story of 'Cave Baby' and the children told their own versions. 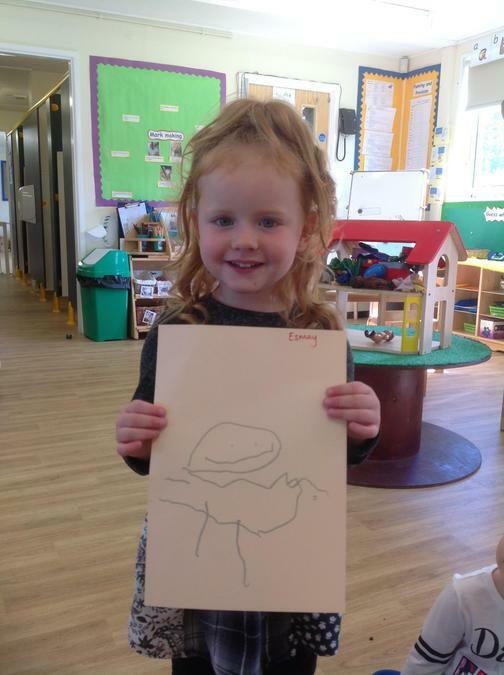 This inspired them to draw some illustrations in their books of the baby and the animals within the story. 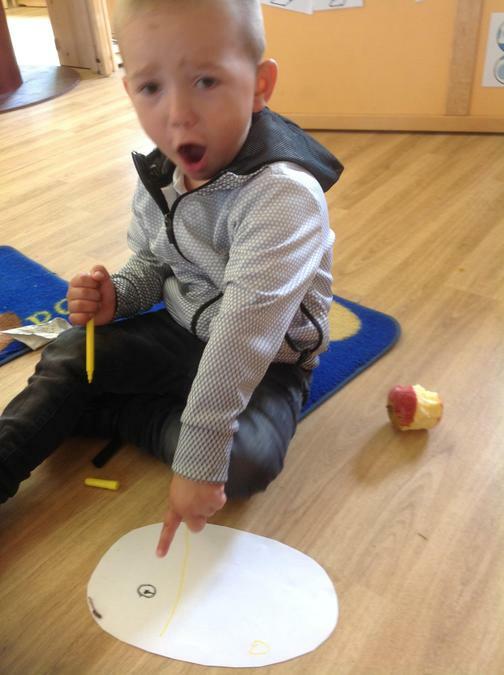 When they had finished their drawings they were asked to retell the story so it could be written in their books, many of the children began with 'once upon a time' and then explained their illustrations. 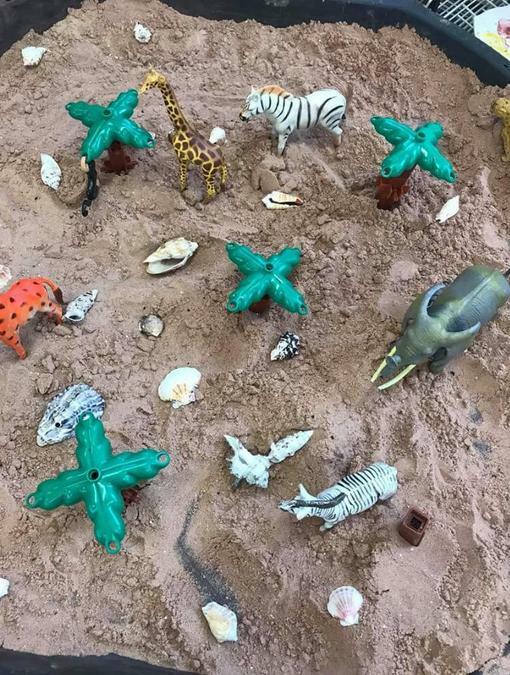 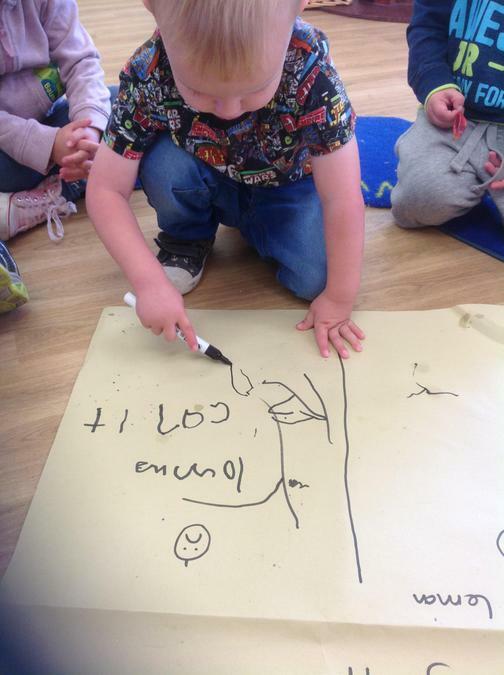 This activity helped to show the children how stories are structured and to develop their imaginations and creative story telling skills. 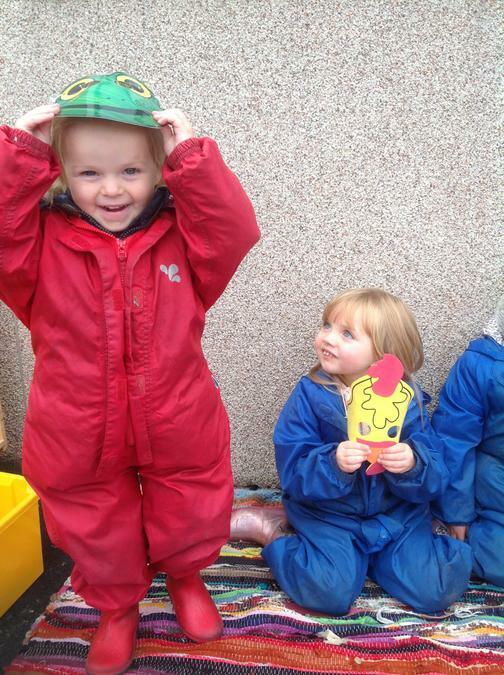 The children were very proud of their story books and wanted to share them with each other. 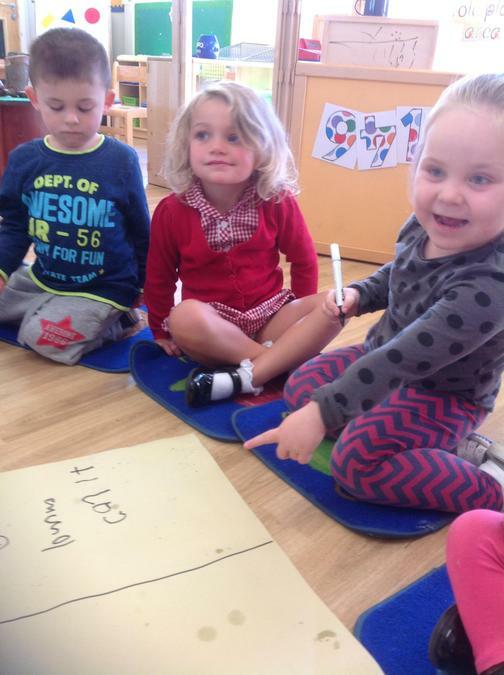 This week we have chosen the story of 'Cave Baby' to base a lot of our learning activities around. 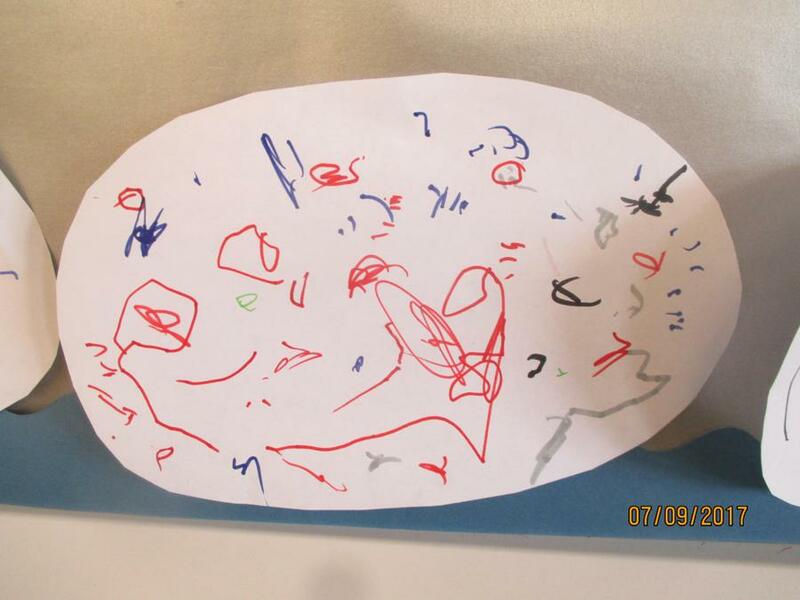 It's a wonderful story about a baby that draws lots of pictures of animals on the walls of the cave, the baby goes on an adventure with a woolly mammoth and ends up creating pictures in their cave. 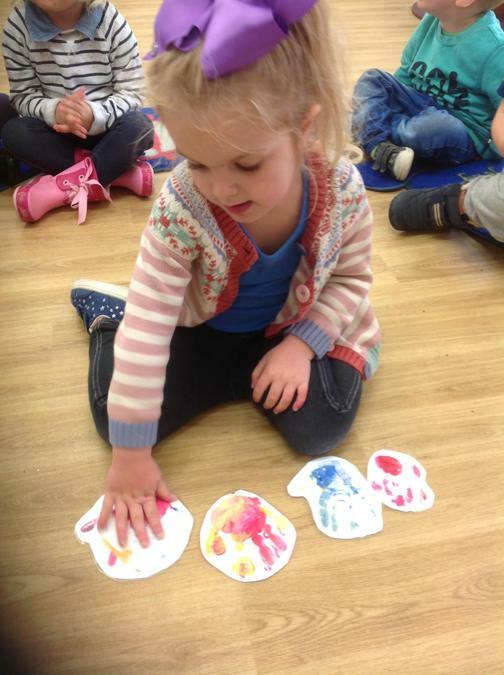 It really is a lovely story that encourages the children's mark making skills within their creative pictures, it describes colours and patterns and even provokes the children to think about different feelings as the baby goes on the adventure. 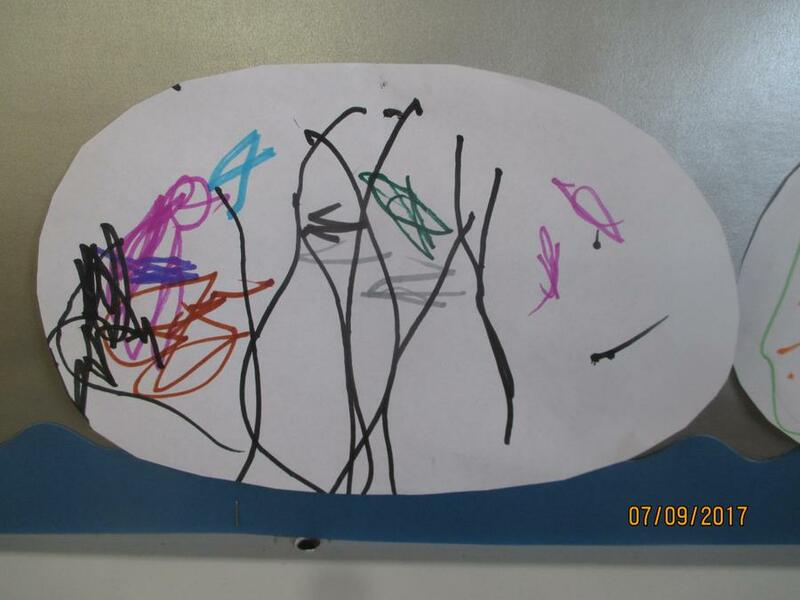 The children asked if we could make a cave like the Cave babies in the story and make paintings to go on the walls, so that's exactly what we set out to do. 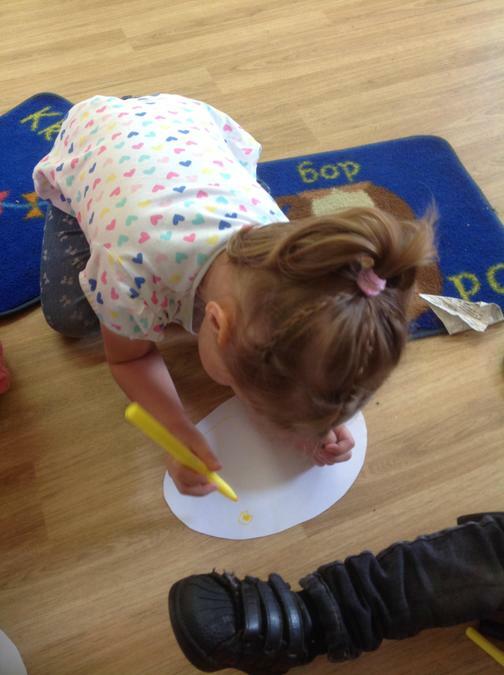 The children looked at the paintings in the story and made their own creations, they really thought about what coloured paint they needed and what patterns they should include on the animals; stripes, spots, zig zags. 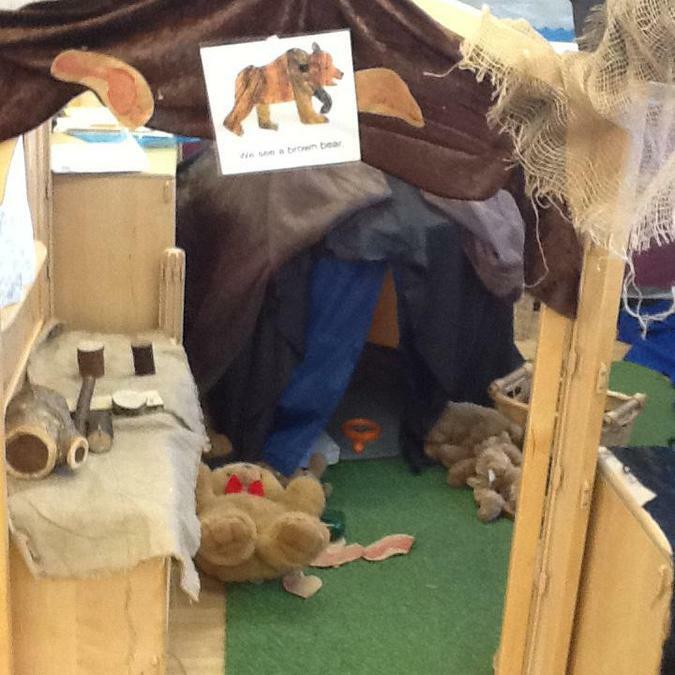 We made a cave using lots of dark materials and added the children's amazing drawings, we put some blank paper on the back of the cave to encourage the children to role play drawing like Cave Baby. 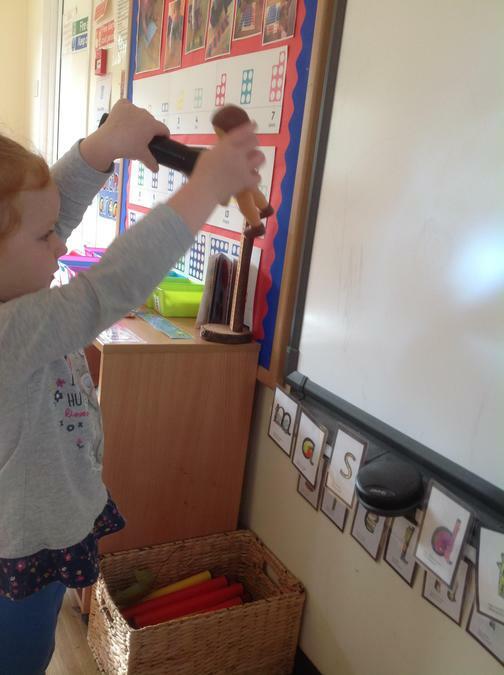 The children soon realised that actually once inside the cave it was very dark and that they couldn't see the pictures very well, so they asked for the torches to shine the light on them. 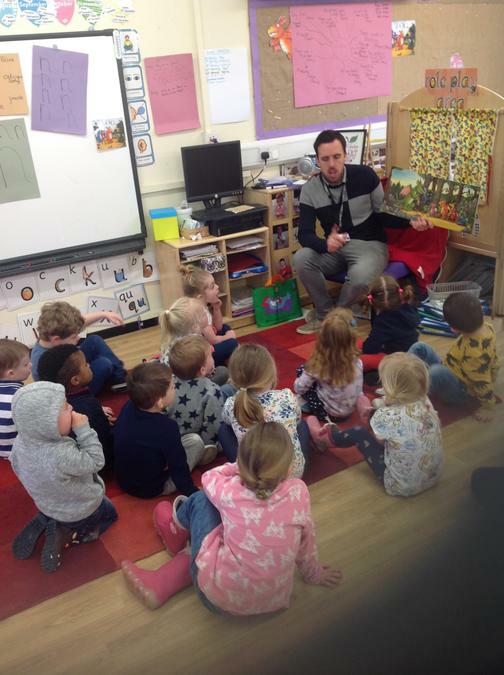 We had the wonderful pleasure of Mr Leeson joining us in Nursery to help us work in our activities. 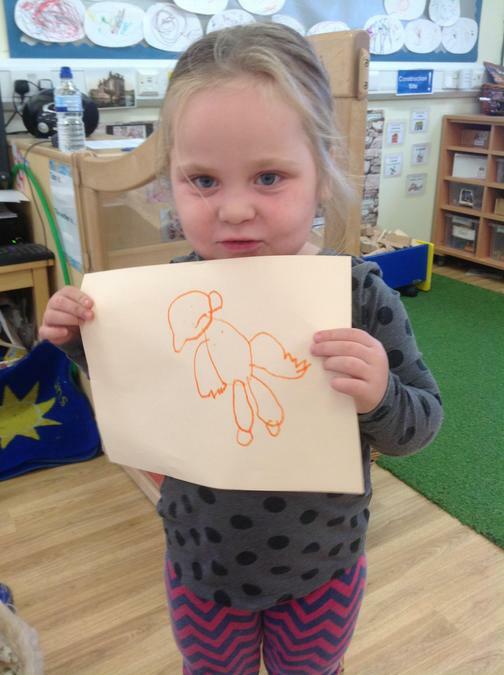 During our circle time we were encouraged to look at the troll in the the story of 'The three billy goats gruff', we observed the trolls distinctive feature's; the big nose, 2 eyes, pointy ears, big body etc. 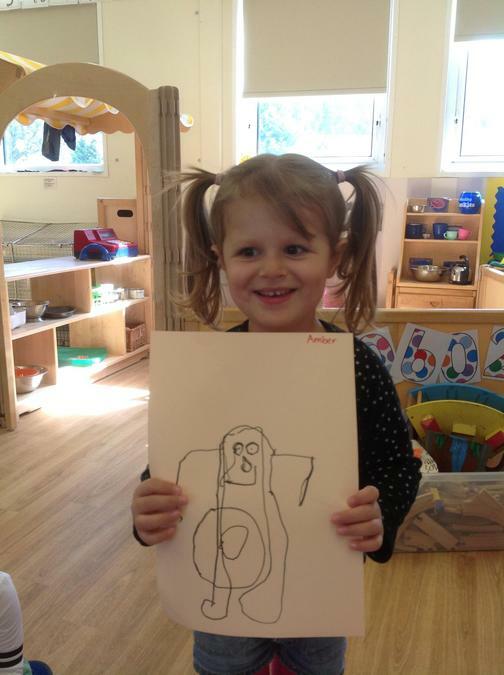 As the children mentioned the features Mr Leeson modelled how to draw a representation of the troll. 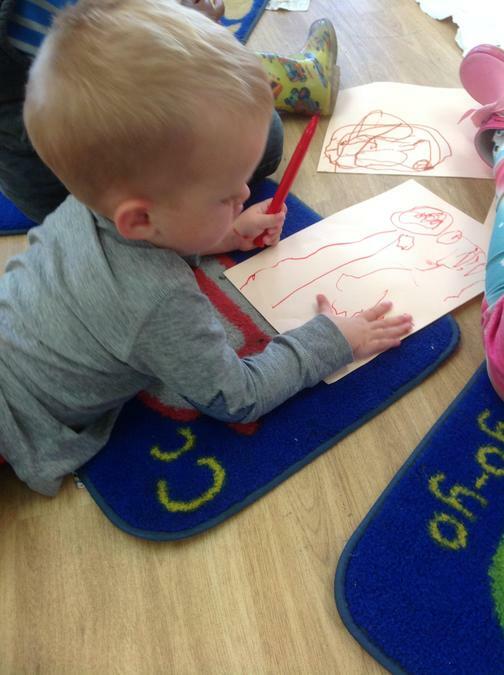 The children were then asked if they could draw their own trolls, again they were encouraged to think about what features the troll had so they could include them in their drawings. 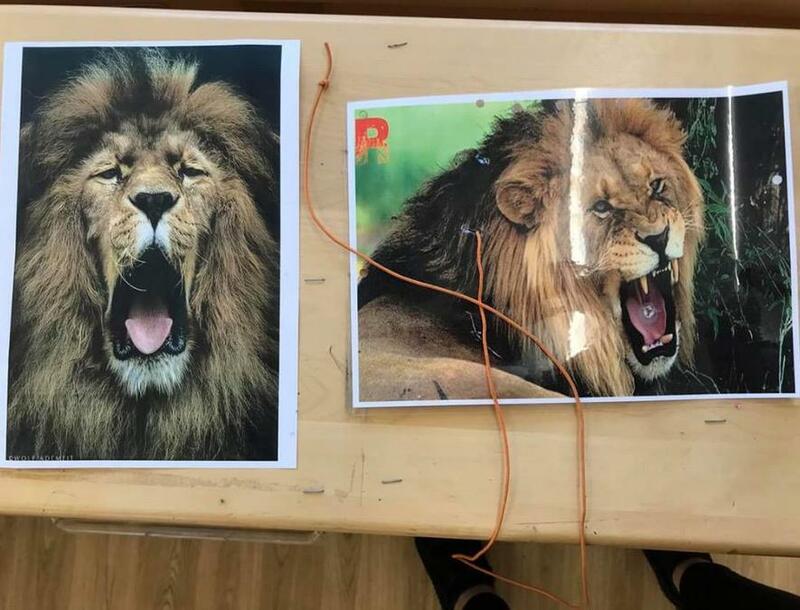 As you can see they put a lot of thought into their creative pictures. 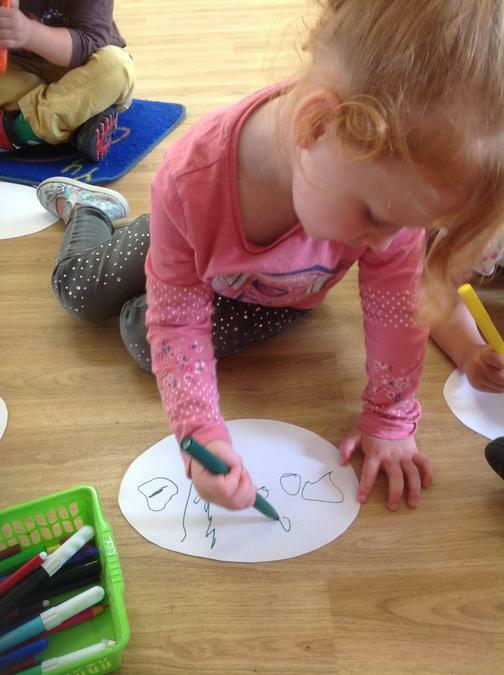 This week in the preschool room we have been continuing to use the story of 'The Three Billy Goats Gruff' to extend our activities. 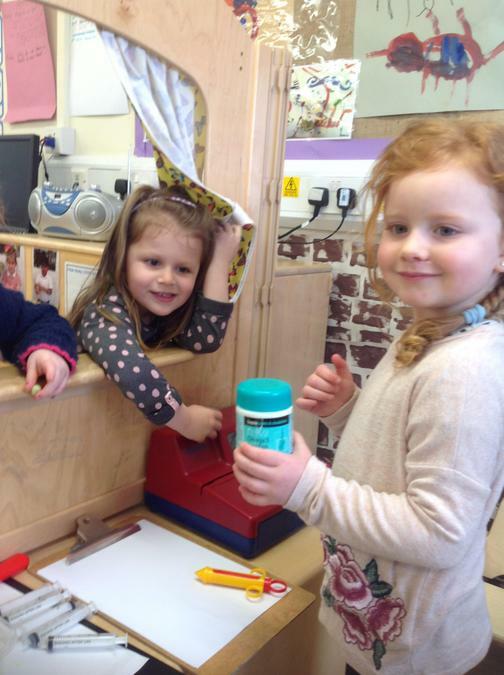 We have been building bridges using all sorts of different resources, such as the wooden blocks, lollipop sticks and play dough, paper, card and cellotape. 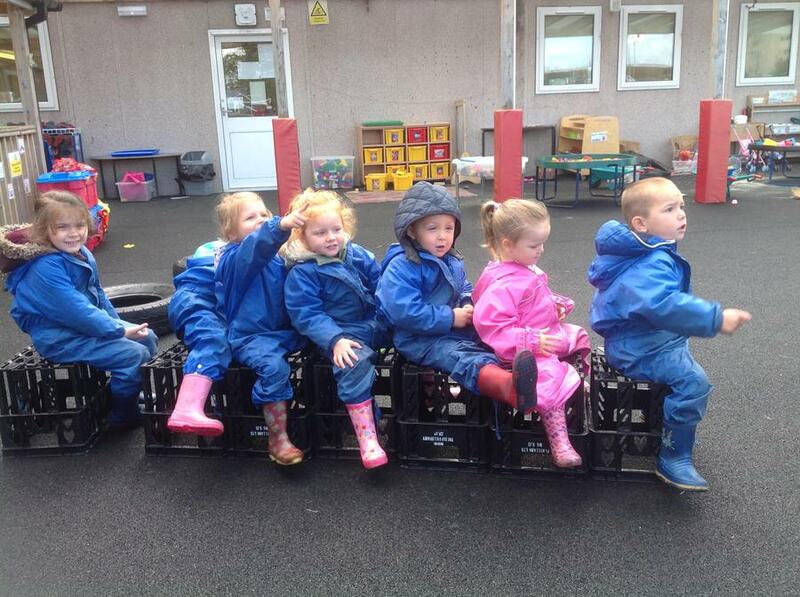 The children were encouraged to create their bridges to get the goats over the water in the tray. 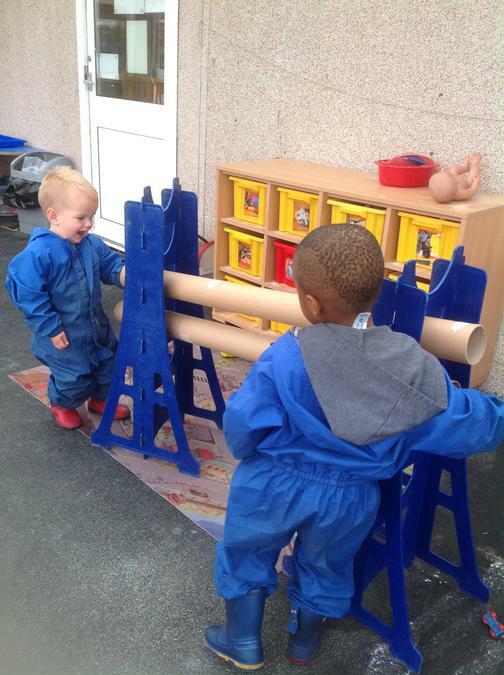 They explored different ways and techniques to ensure their bridges were balanced and strong. 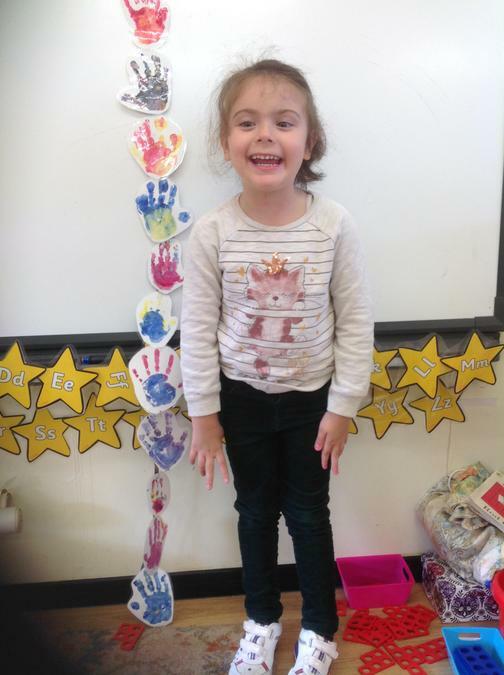 We provided the children with photos of different styles of bridges so we could all observe the bridges and discuss what shapes they were and what materials they are made of. 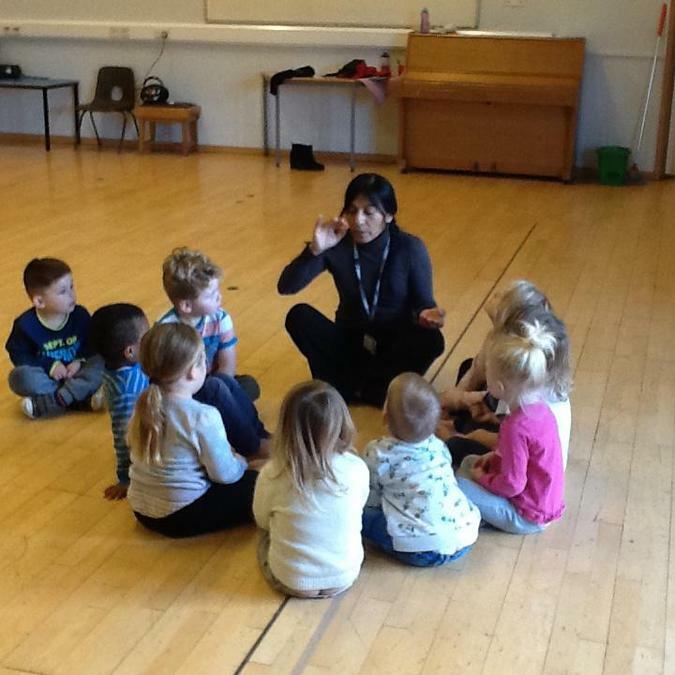 This encouraged the children to share their thoughts and ideas and to learn some new words to describe. 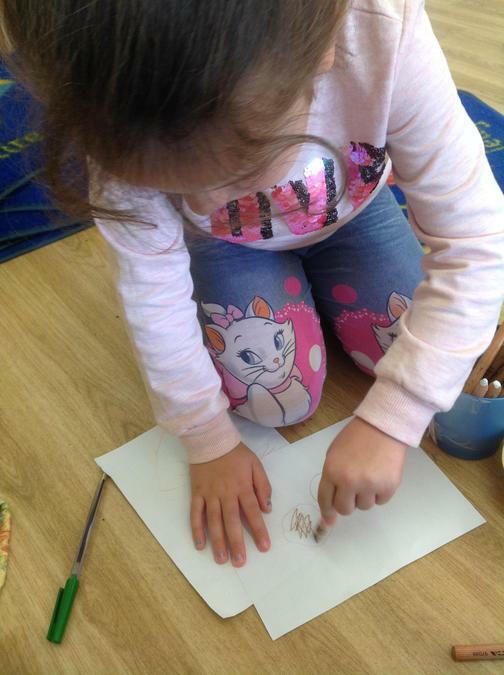 After making our observations we used the pastels to draw our own bridges, the children were encouraged to use the photos to refer to. 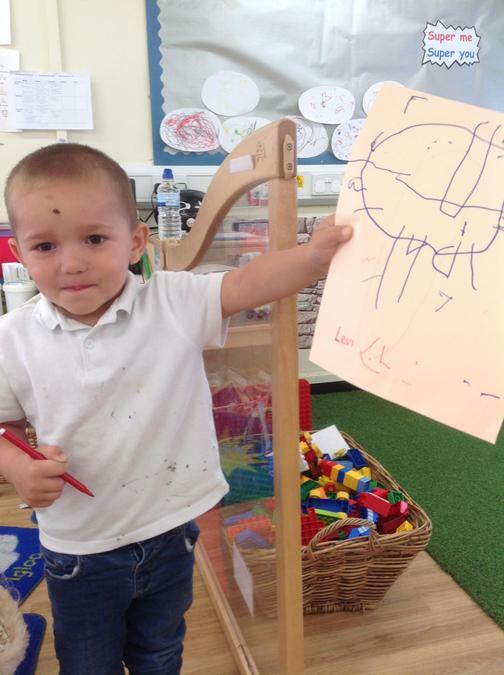 As you can see the children were very careful to include some detail within their drawings to represent the bridges. 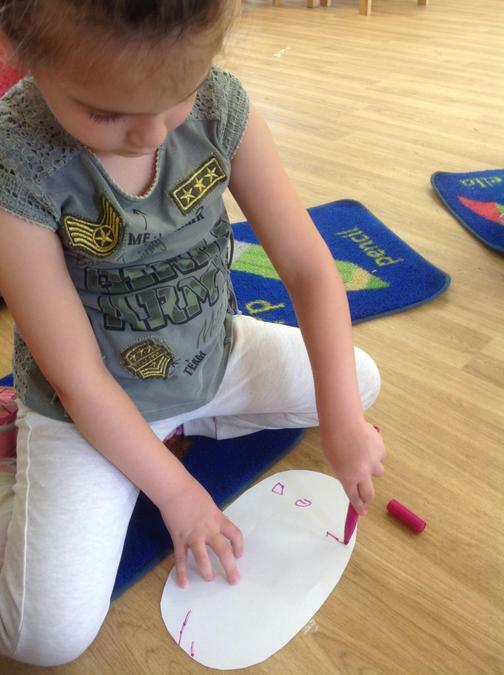 The children all wrote their names onto their art work; they really are doing fantastic at forming the letters in their names. 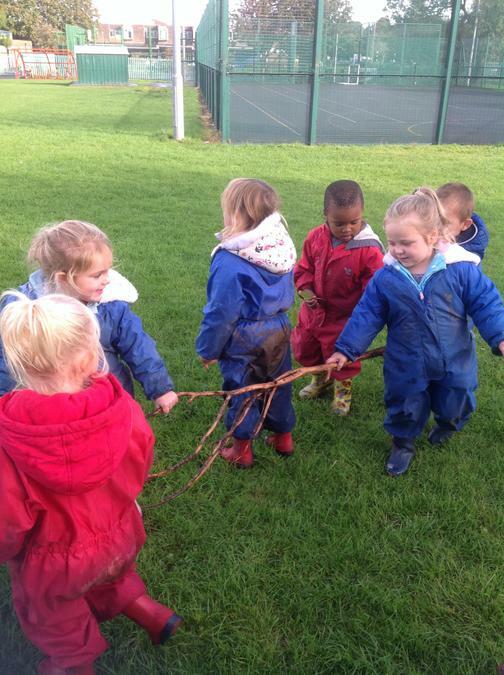 Today we went on a wintery walk around the school grounds to explore and observe the effects of a frosty morning. 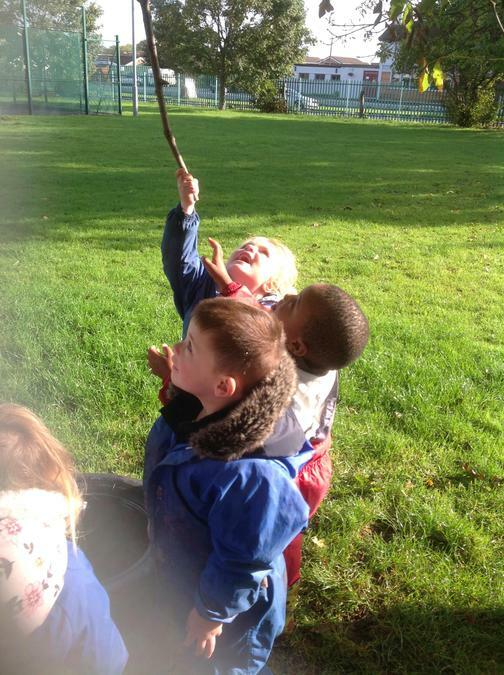 The children looked at the trees which encouraged them to discuss and share their thoughts and ideas about the frost on the trees. 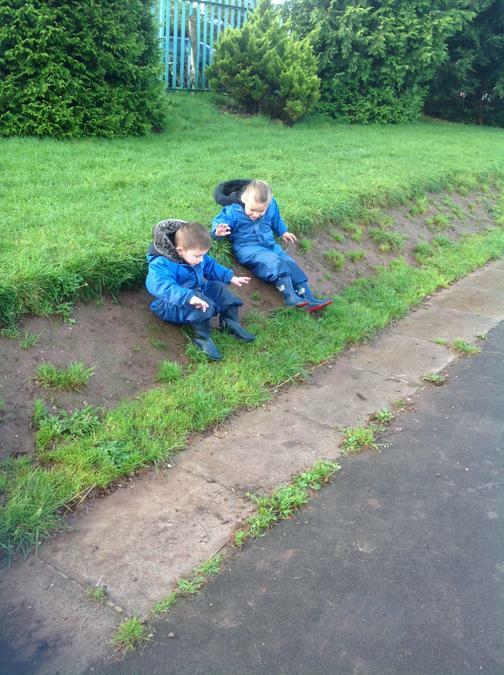 They said,"Look it all frosty on them trees." 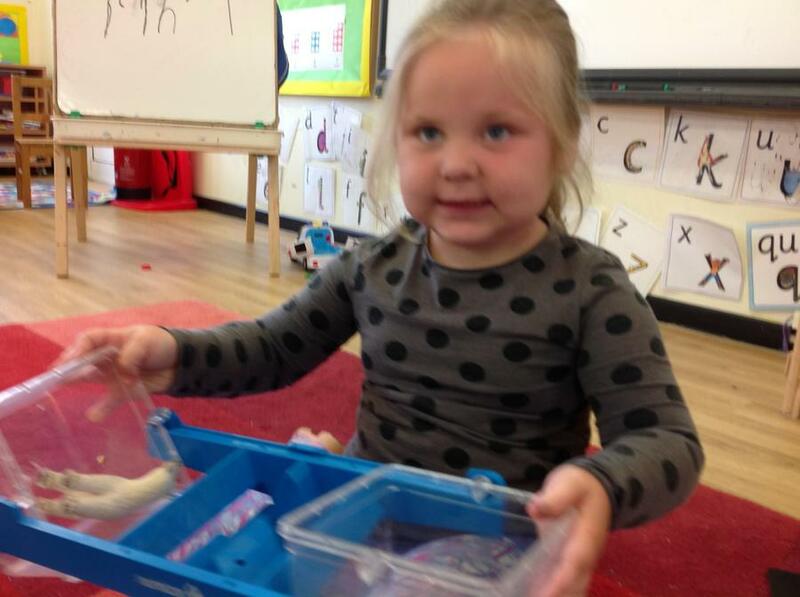 "That is white and sparkly." 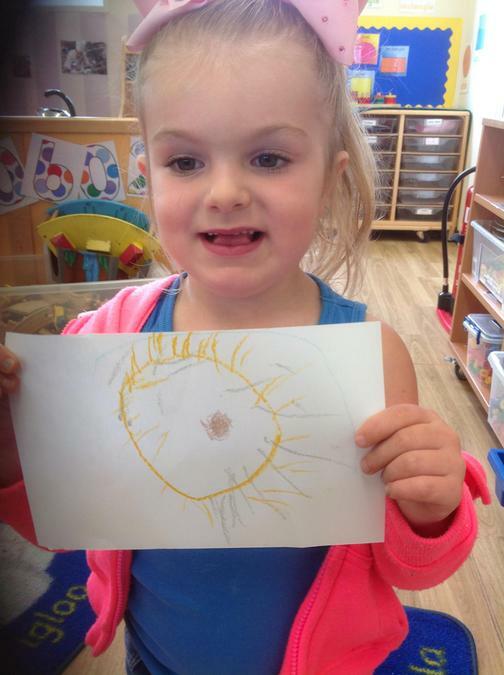 "I can see it is icy and really really cold." 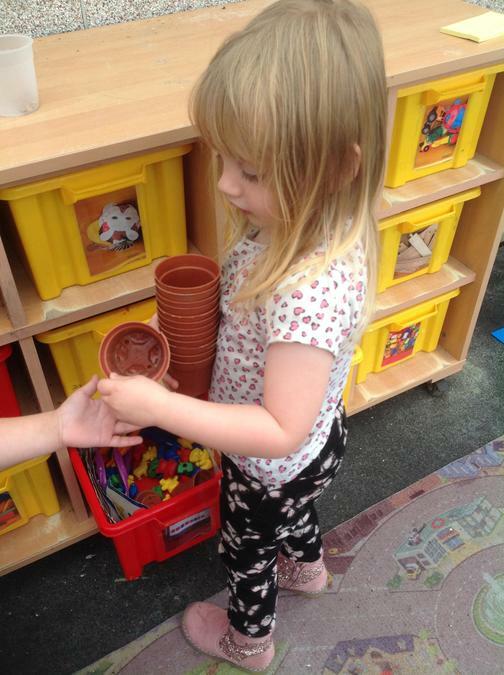 "When I touch it my hand get cold." 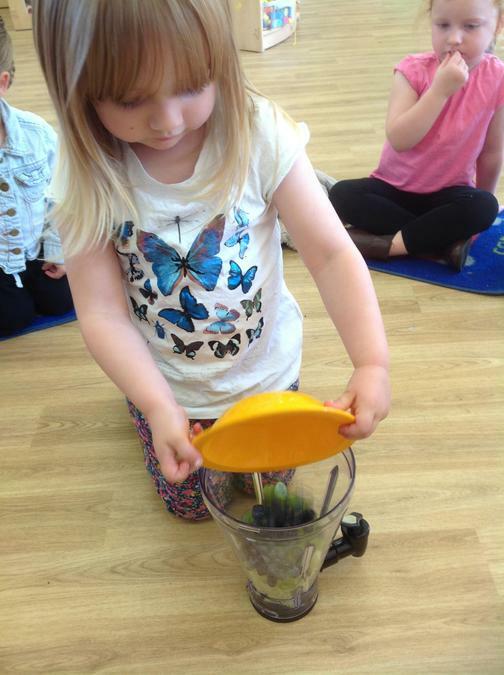 "I scrape it up and get big bit of ice." 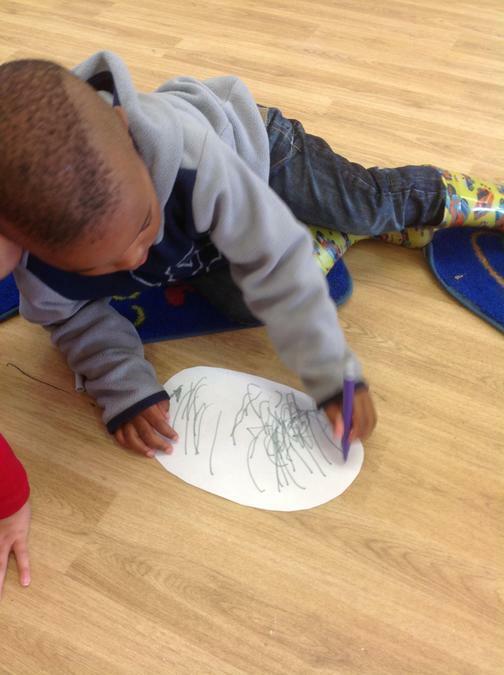 "It gone all over them leaves and it up top that tree." 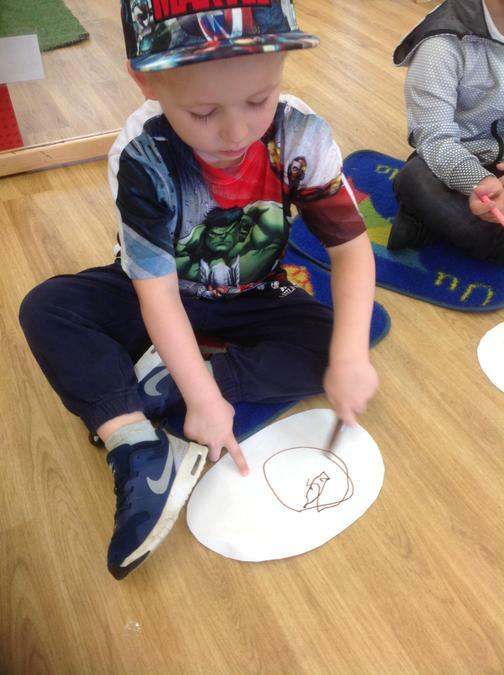 The children realised that when they scraped the ice using their fingers it left a mark, they experimented making lines, circles and some even tried writing the letters in their names. 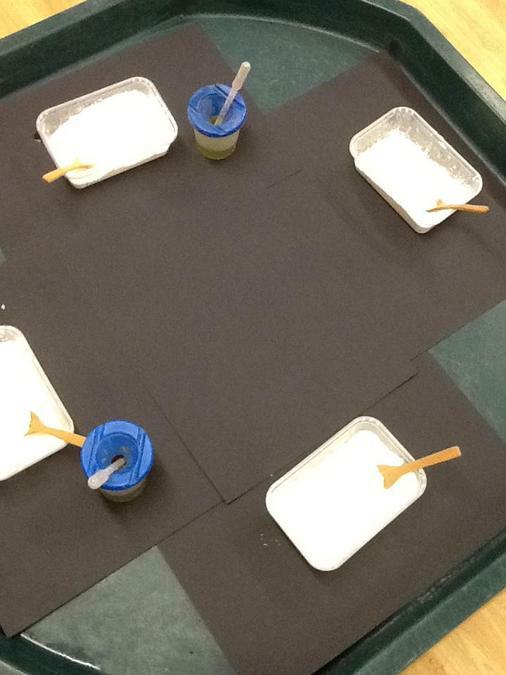 We made handprints on the frost that was covering the table and some children realised that this caused the frost to melt away, they said, "It all melt, I can feel it wet on my hand." 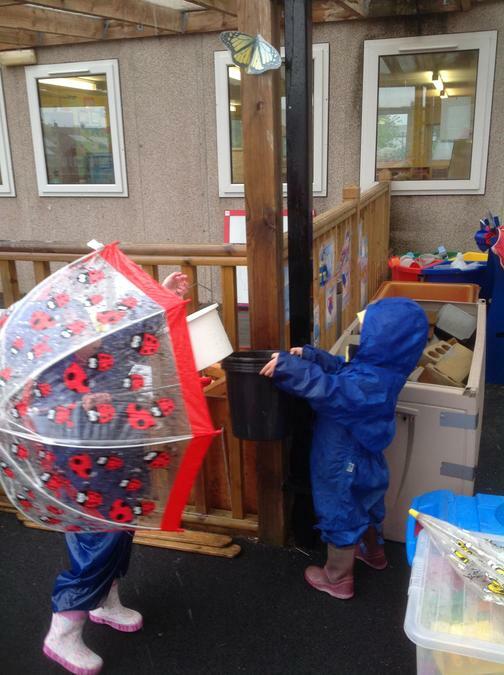 "It make my hand cold and wet." 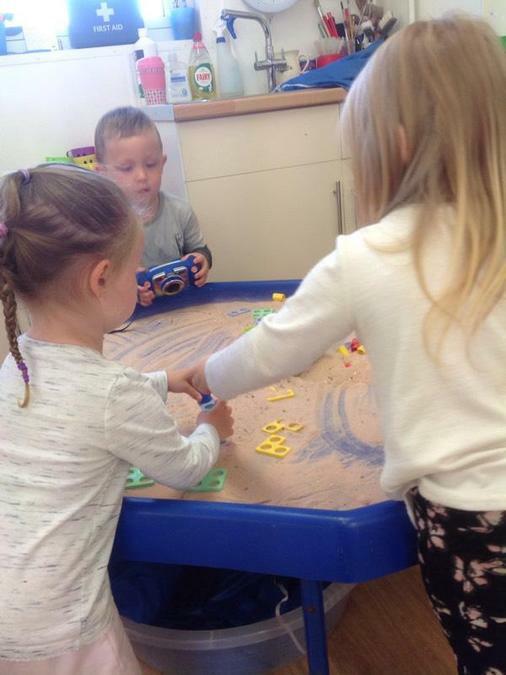 "I see my hand on table now ice go away." 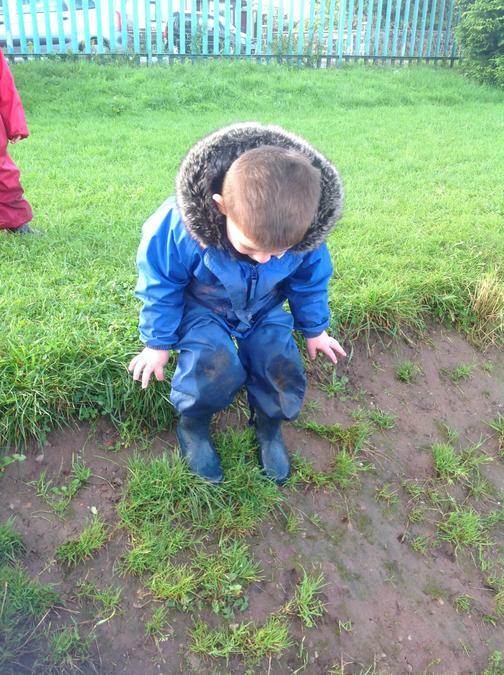 To warm up we ran across the frosty field and made tracks of our footprints, some children chose to lay down on the grass to make snow angels, this showed good use of their gross motor skills and coordination as they moved thier arms and legs. 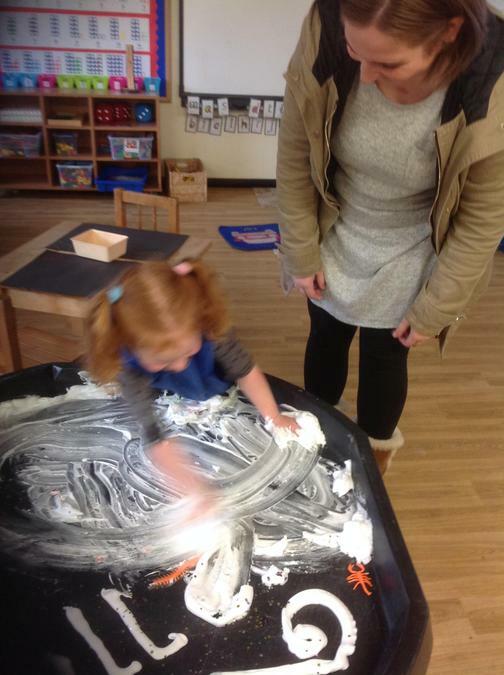 To follow on from this wonderful chance to explore the frost and ice we went back into our warm classroom to have a story about Jack Frost, this presented the children with an imaginative explanation of how the frost appears. 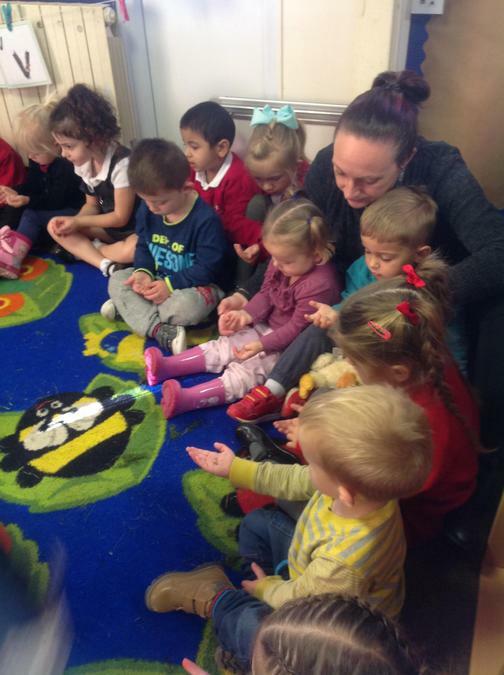 The children were all very engrossed in the concept of the story. 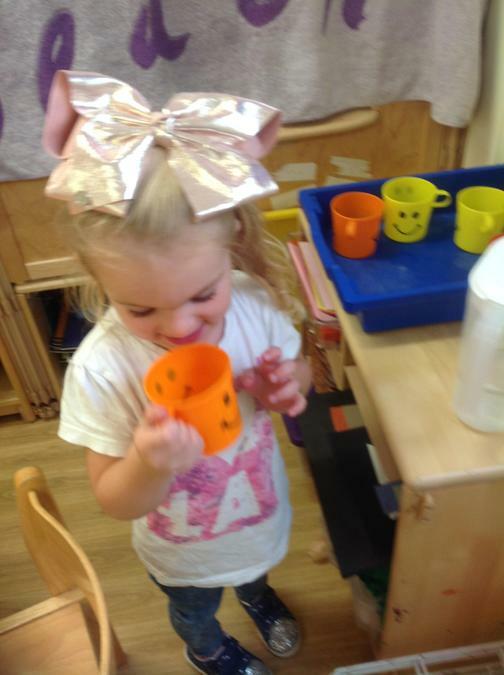 This week we have been celebrating Christmas!! 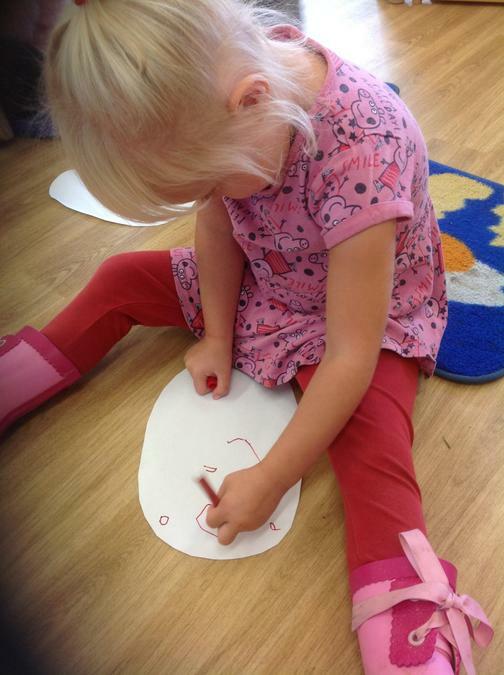 We have decorated a tree together, visited Santa's grotto and wrote and posted a letter to Santa. 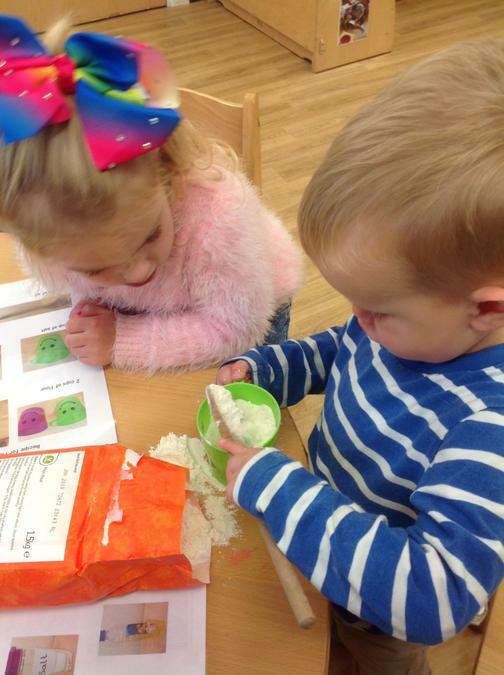 The children have enjoyed making and playing with ginger bread play dough, as well as making Christmas bags, stocking and cards. 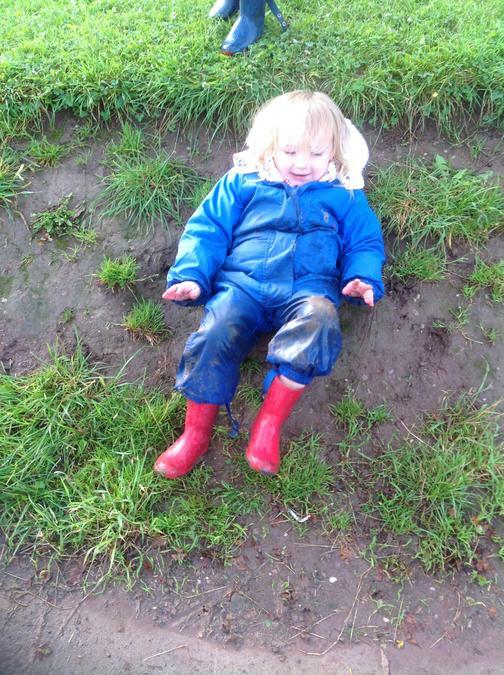 We hope that you all have a very happy Christmas and a great new year! 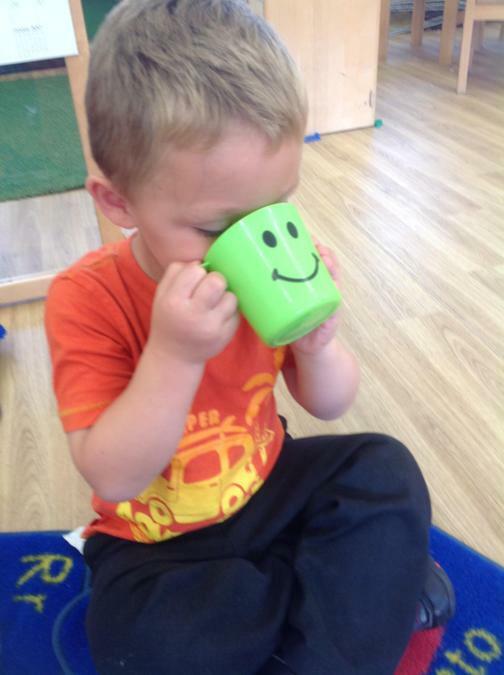 We look forward to welcoming you all back in January. 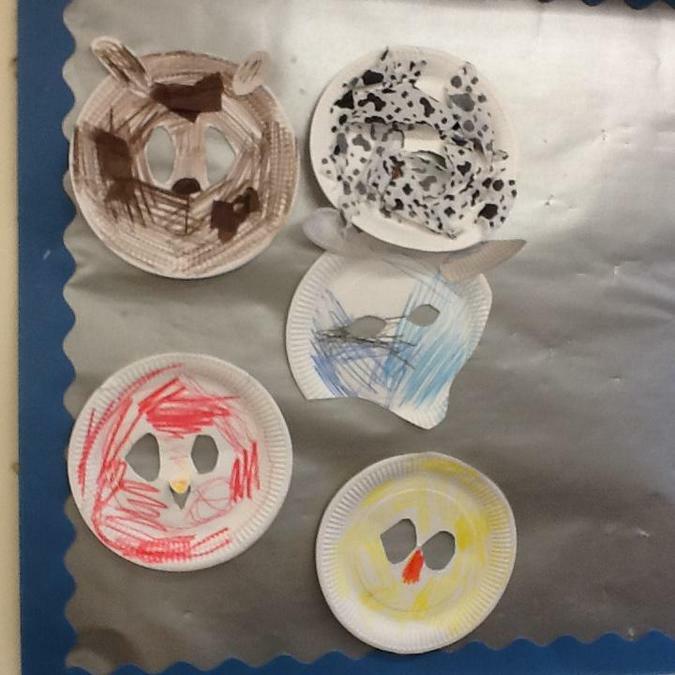 This week in pre-school we have been looking at the book ' Brown bear, Brown bear, what do you see ? 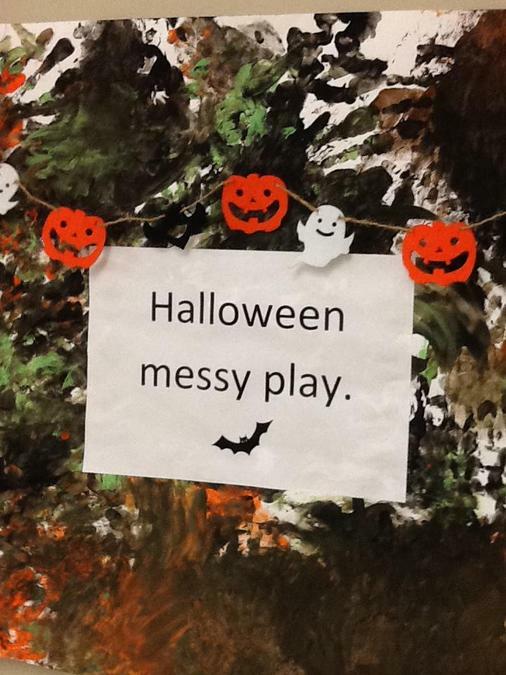 by Bill Martin. 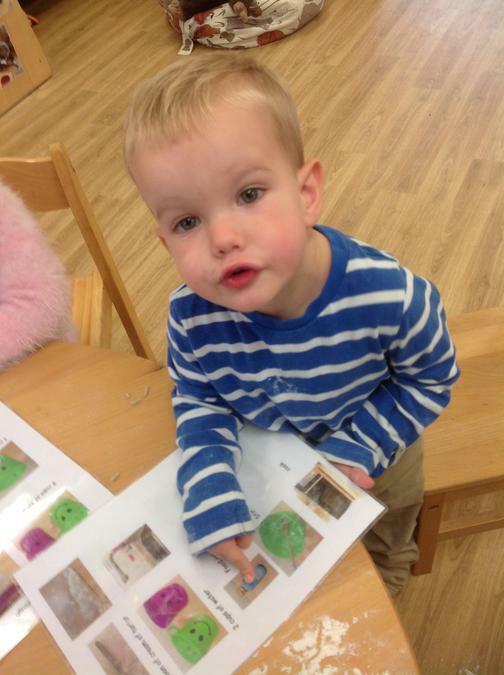 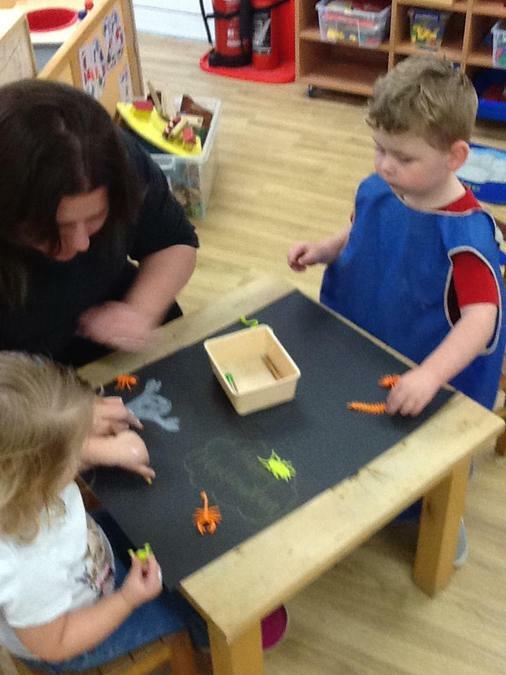 The children have been learning their colours whilst exploring in the bears den. 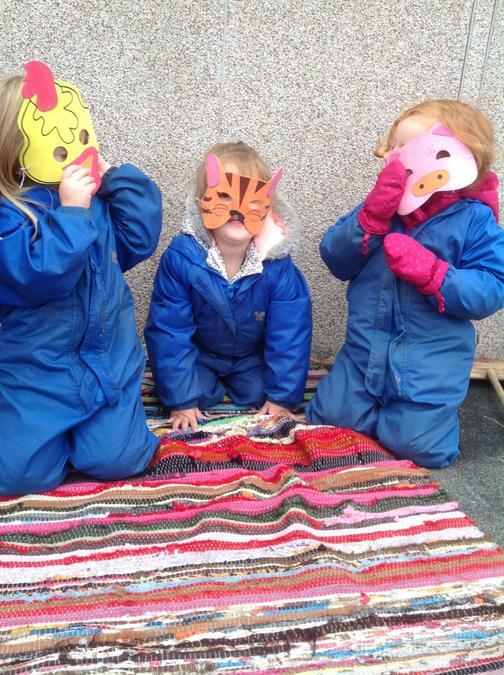 They have been making animal masks, story stones and designing and constructing their own den for the bear. 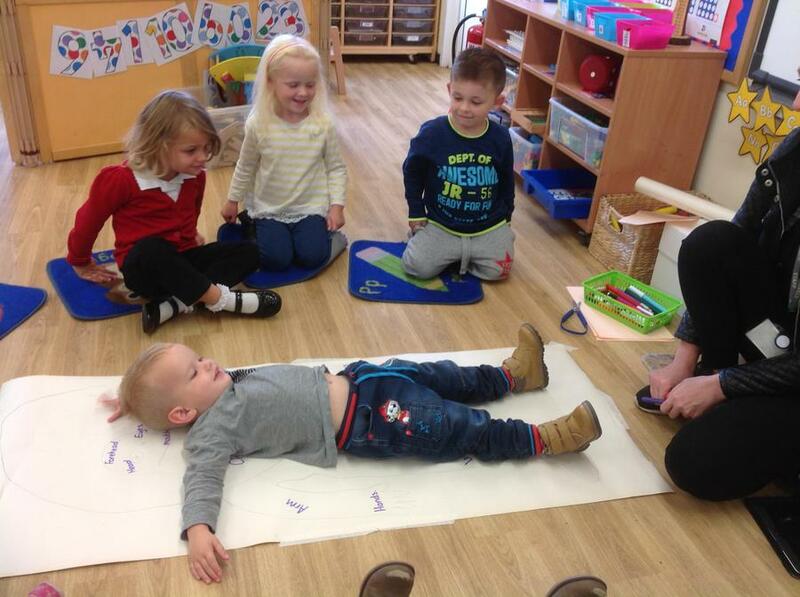 We have also done some animal yoga. 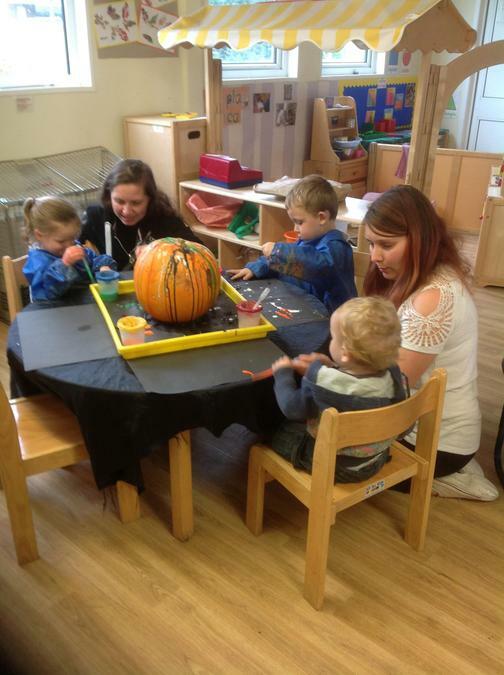 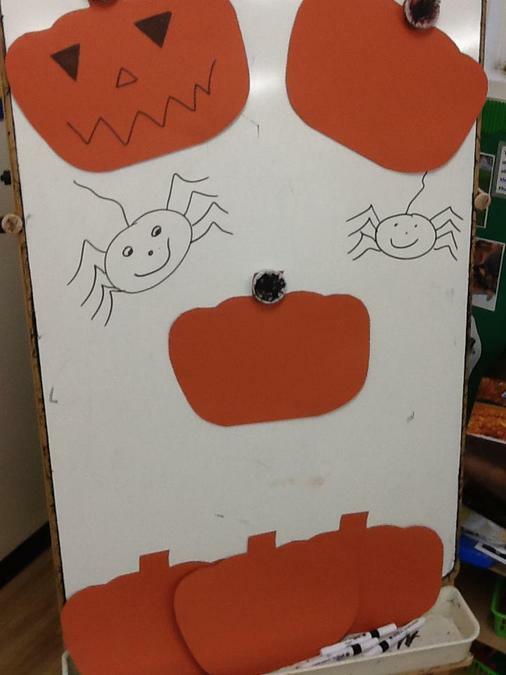 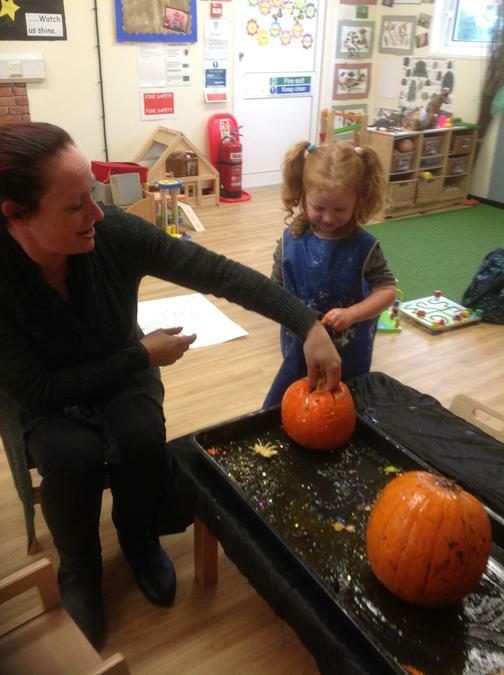 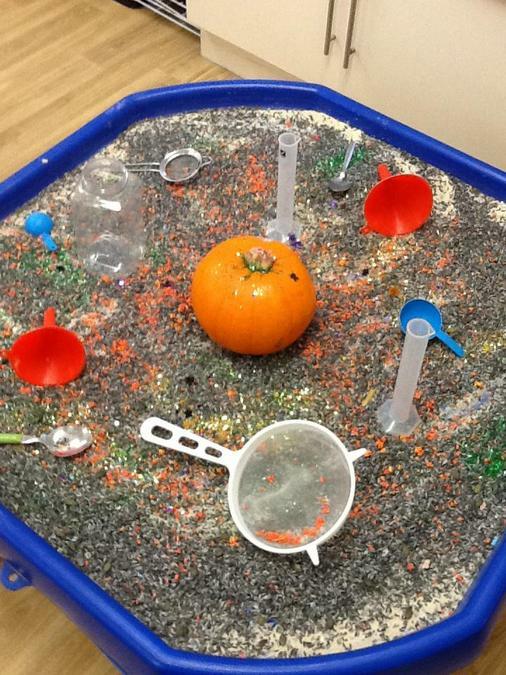 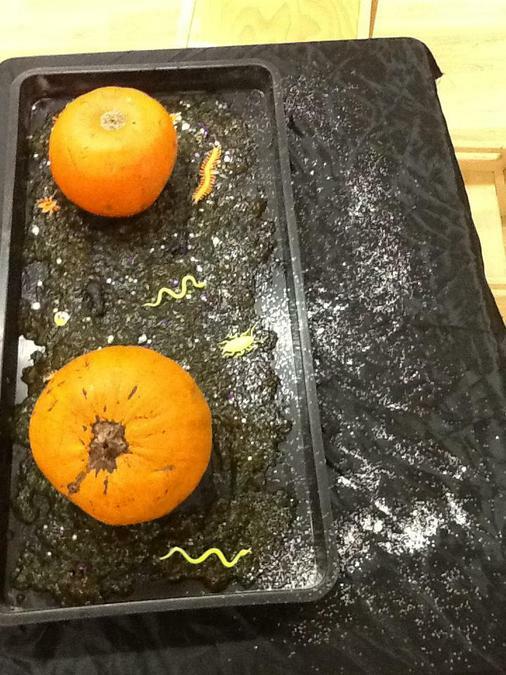 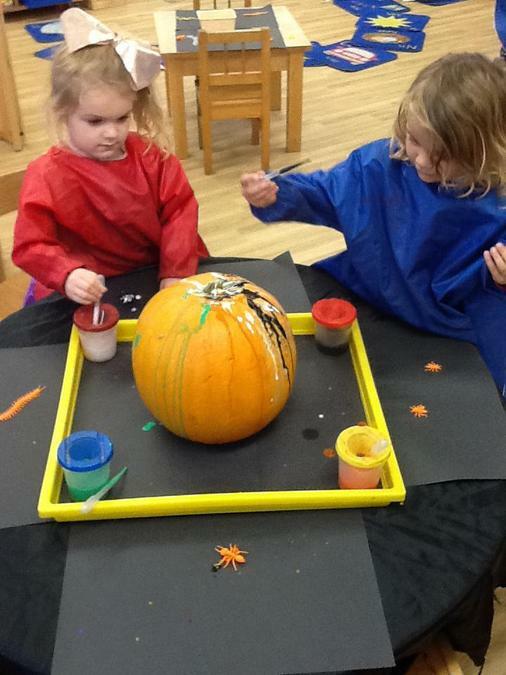 What a fantastic end to this term with our Halloween Messy Play session! 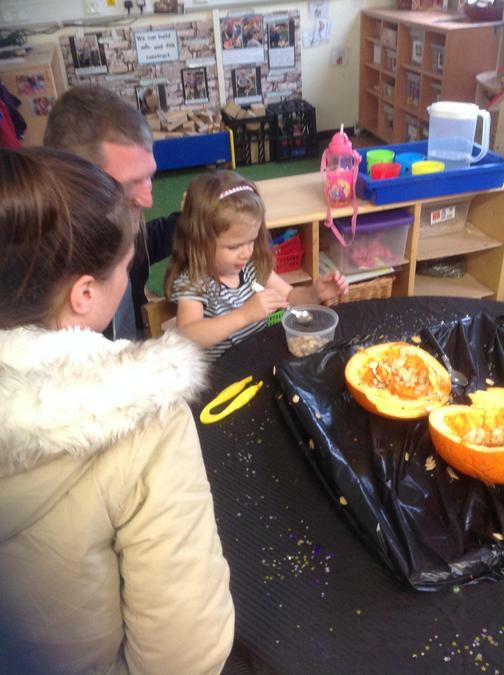 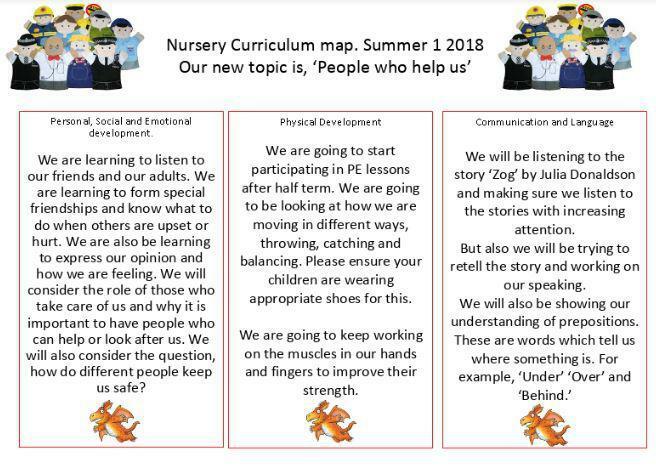 Thank you to all of the parents who came along to share in the children's play and to learn about the benefits and learning experiences that this type of play offers. 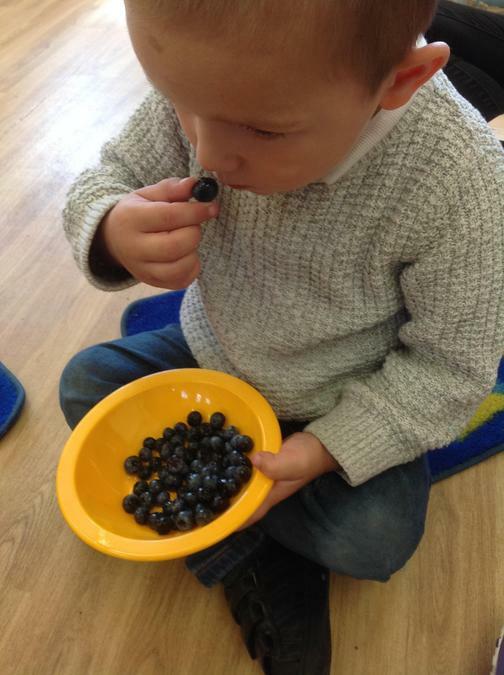 If you try out any of the recipes that you were given at home then please upload photos and comments to your child's learning diary so that we can see what they have been doing too. 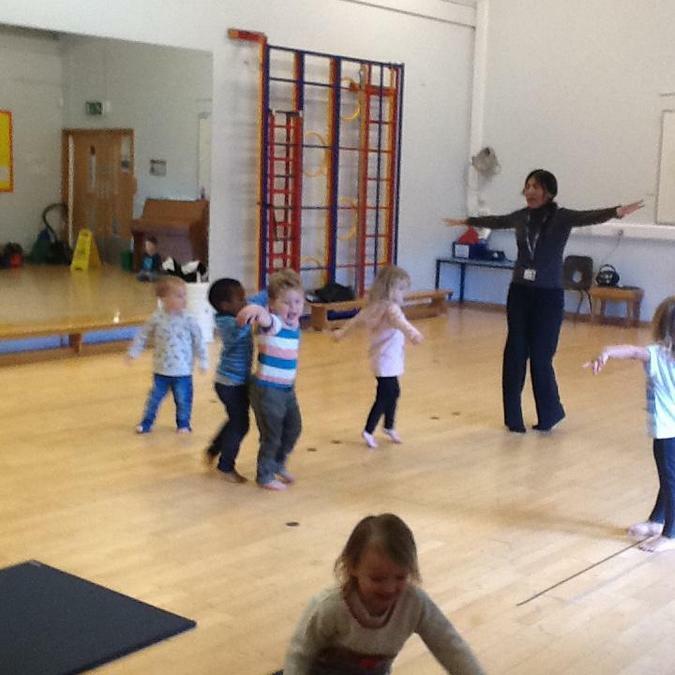 Some photographs of the session. 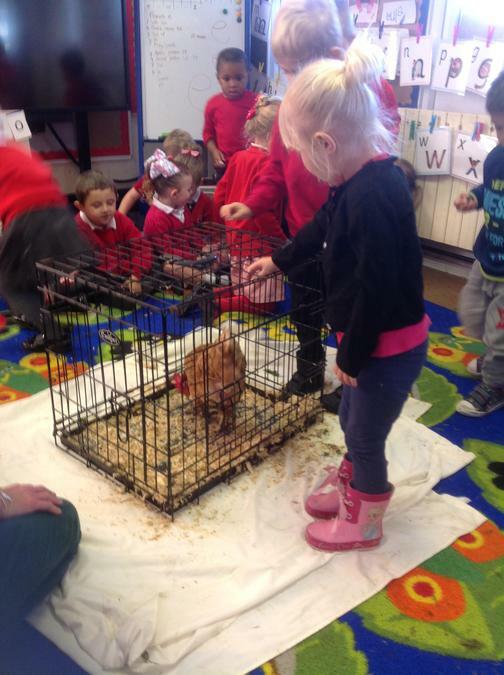 The children have been learning the story of The Little Red Hen. 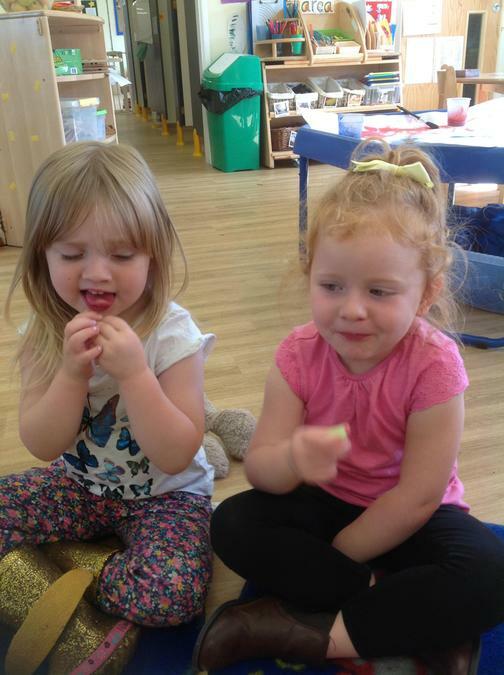 They can join in with the repeated refrains and can make the Makaton signs for the different animals. 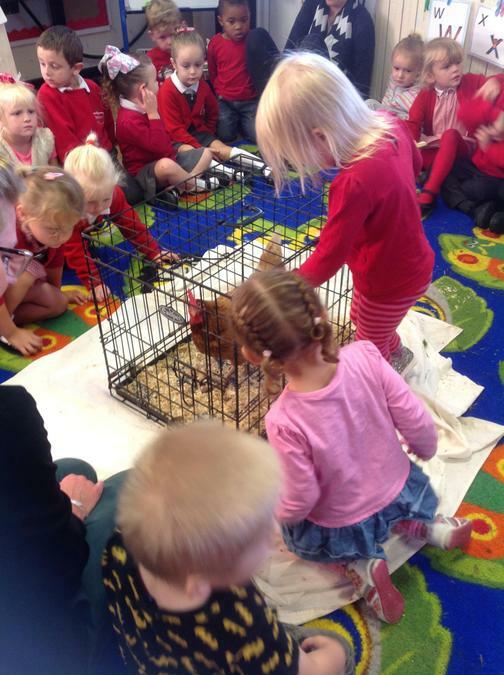 Farmer Nick's real red hen visited the Reception class and the nursery children were delighted to be invited to go too. 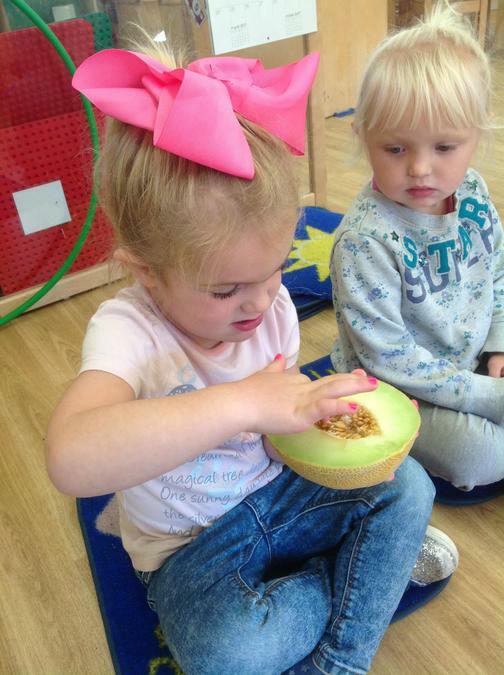 They were amazed to see the size of the hen and were able to handle wheat seeds, see an ear of wheat, grind the wheat into flour and feed the hen with some bread. 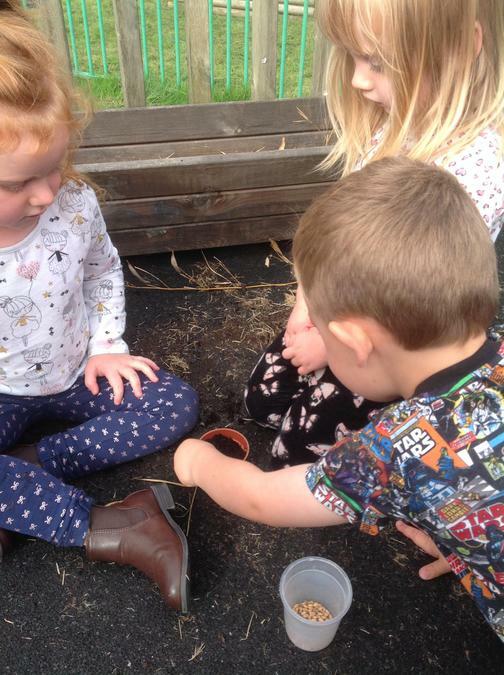 The afternoon children wanted to plant the wheat seed that we had been given. 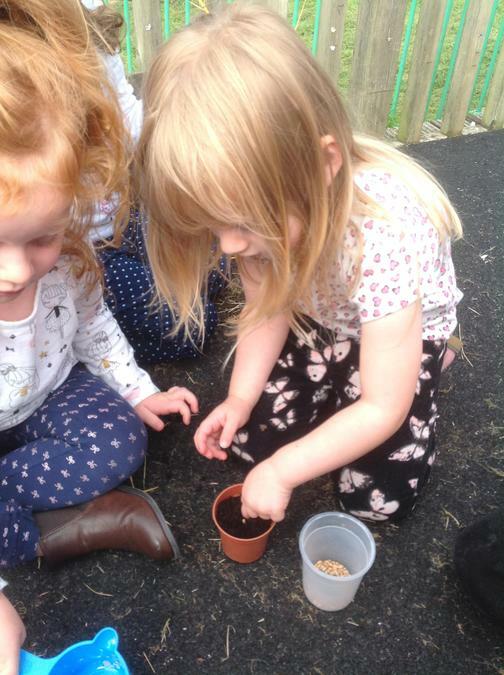 They knew that they needed soil and took some from the plant trough. 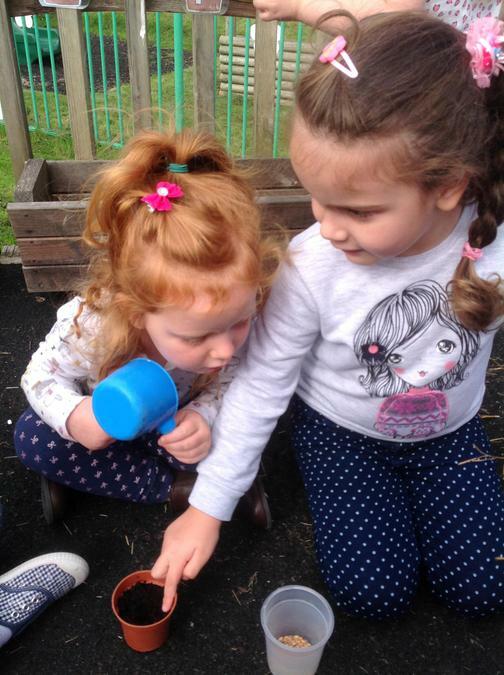 They found a flower pot and each planted a seed. 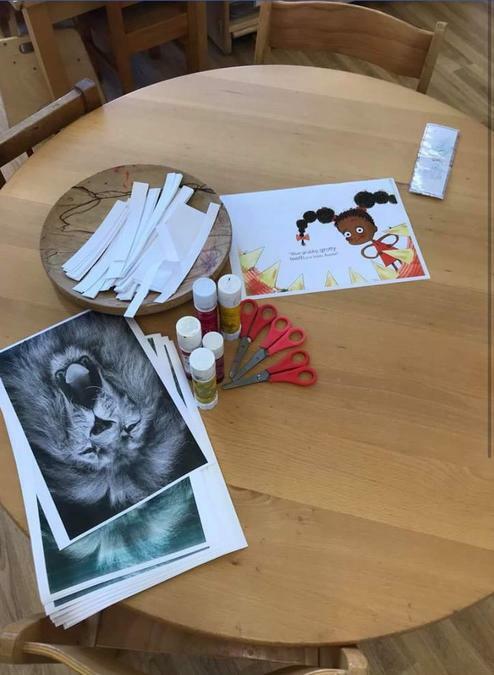 Now we are waiting to see what happens. 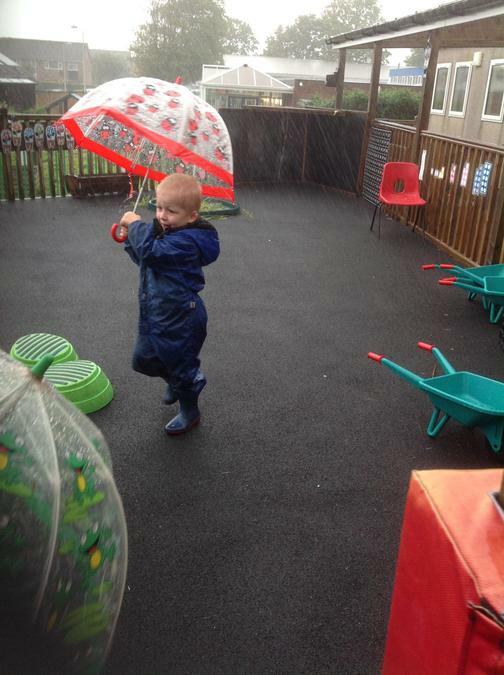 A rainy day last week gave the children the opportunity to puddles on the playground. 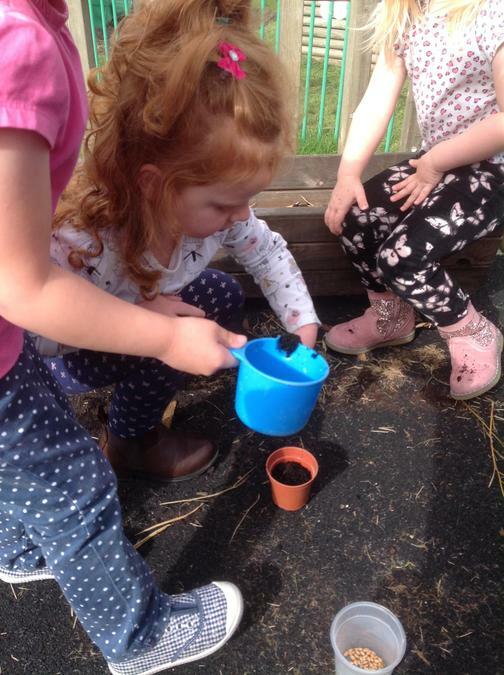 They enjoyed exploring different ways of moving down the muddy slopes and discovered that by shaking the leaves on the tree they could create their own rainfall. 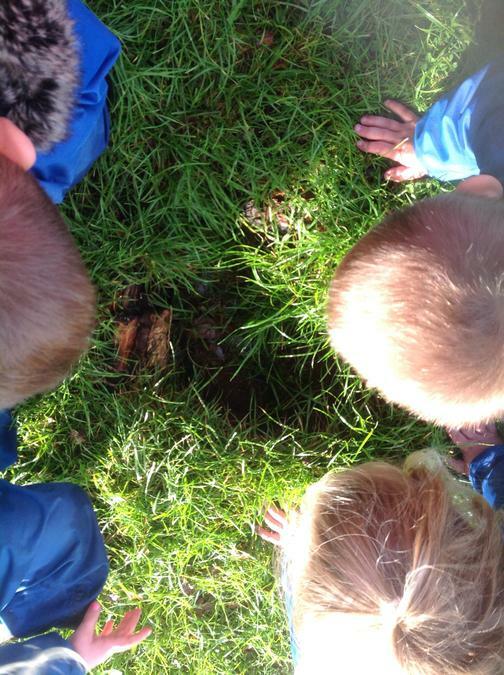 Who could live in this hole? 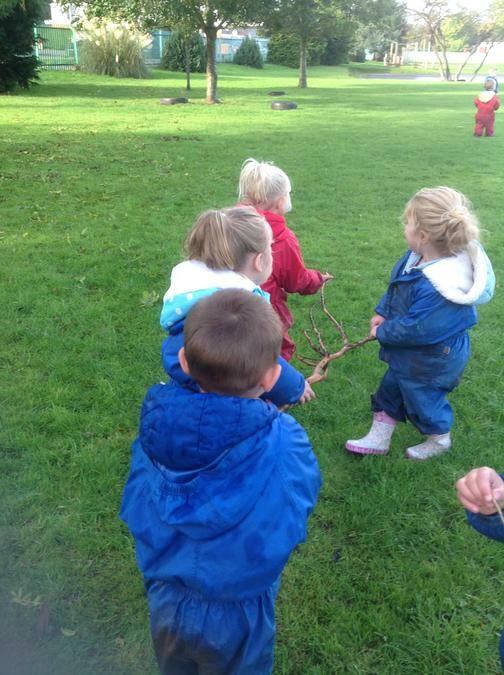 With a little bit of team work a branch was found and carried back to the hole. 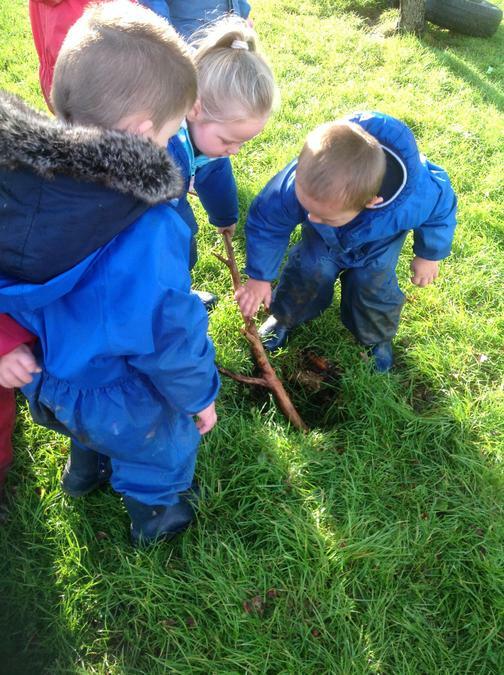 Now whoever lives in the hole will be able to climb out! 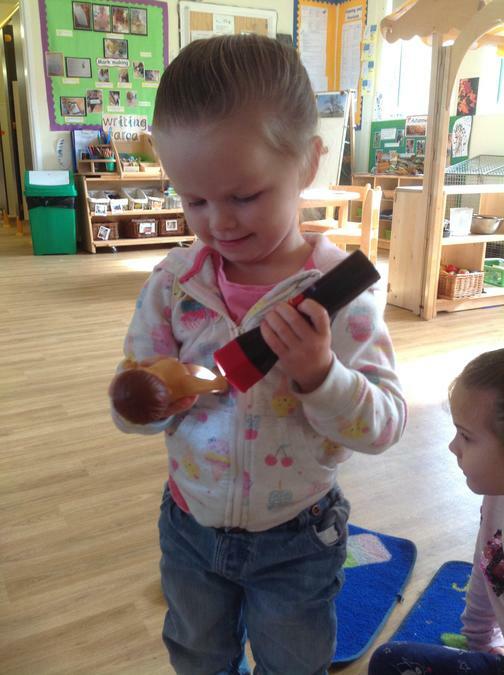 A child brought in a torch which made different coloured light. 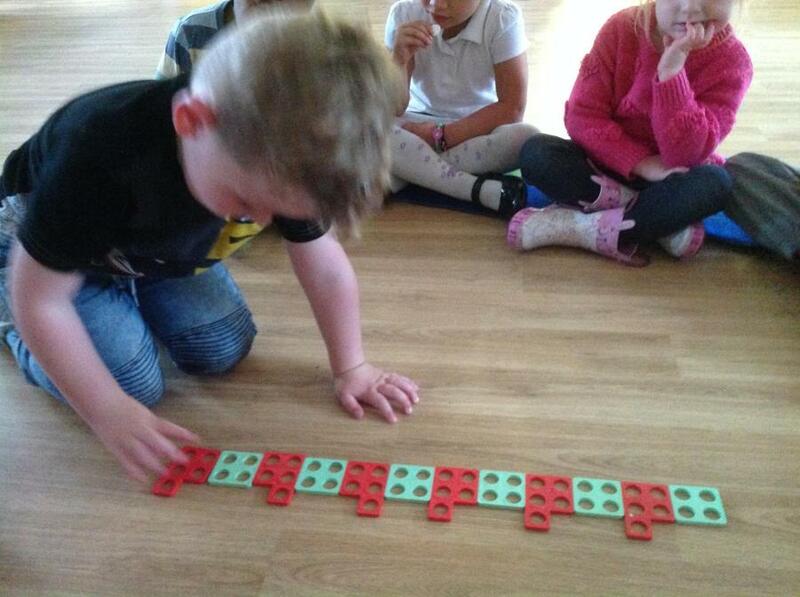 Another child noticed the repeating pattern in the colours so we made some repeating patterns of our own. 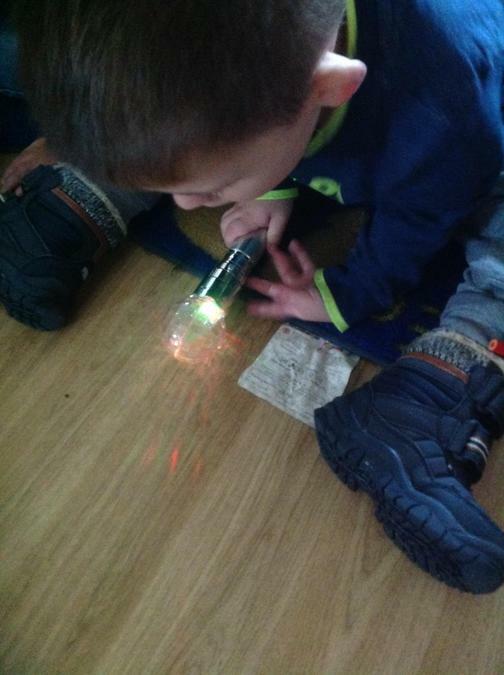 We also got out the nursery torches and explored light and dark with them. 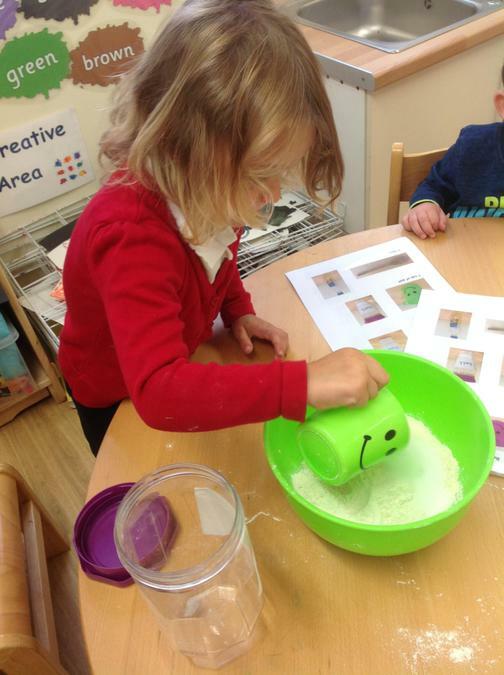 The children followed our playdough recipe, with support, to make their own playdough to take home. 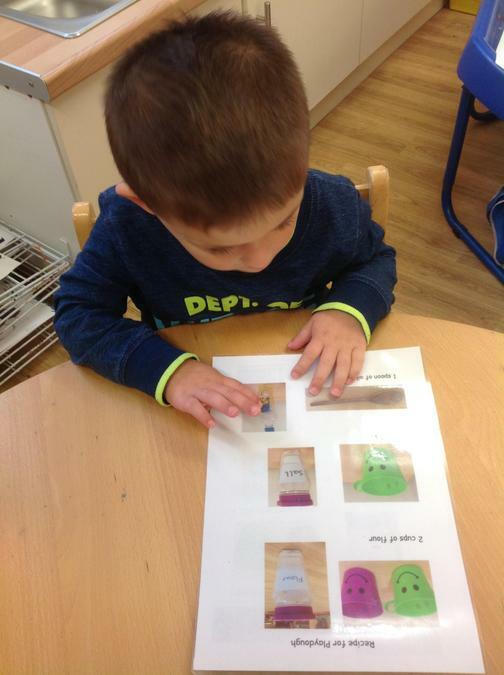 The children are understanding that the pictures and words carry meaning and that they have to be followed in sequence. 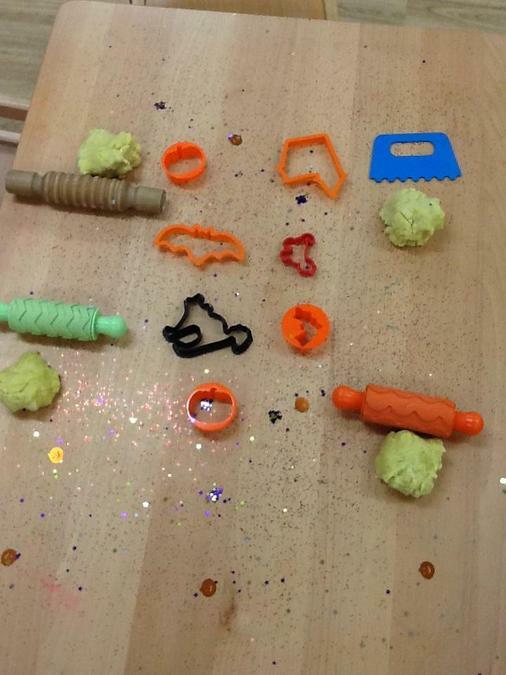 We hope you have fun with the playdough they made. 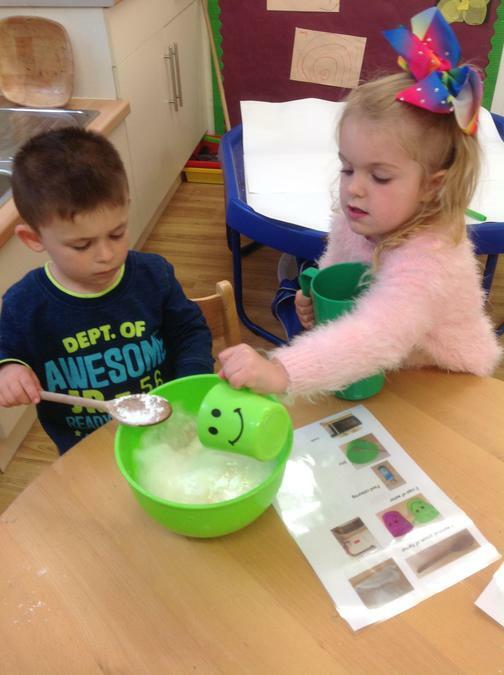 We supplied the recipe so that you can make some more at home and please upload any photos to your child's interactive learning diary, we would love to see them. 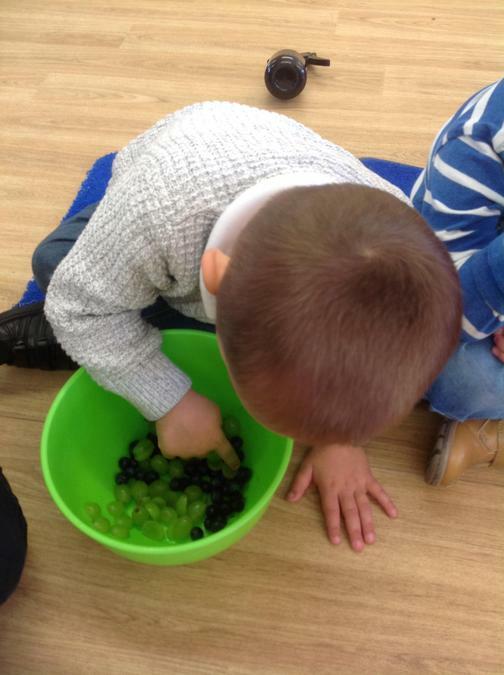 We have been fruit tasting in our room this week. 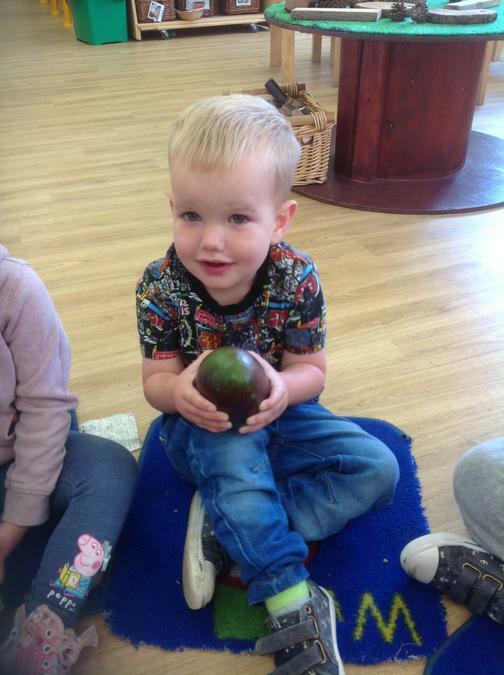 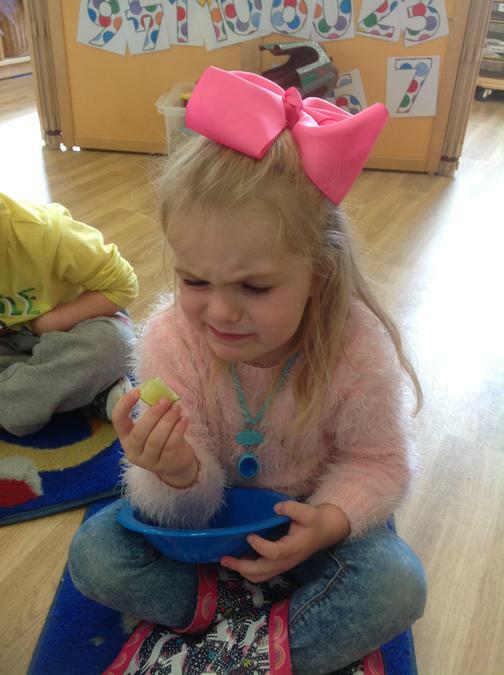 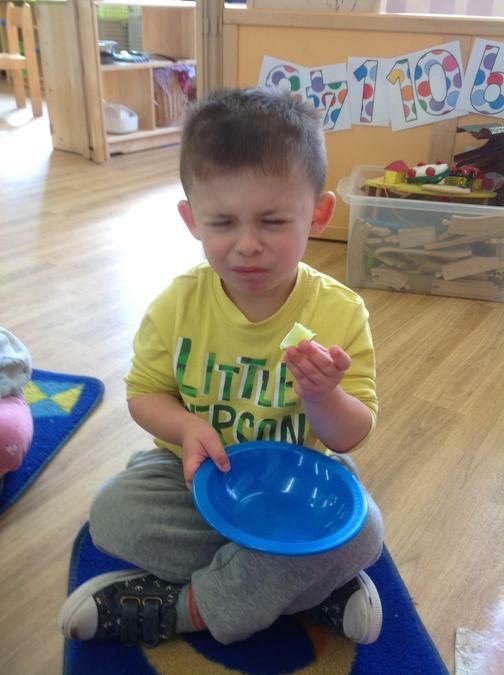 This has encouraged the children to use their senses of smell, touch and taste, to express their likes and dislikes, to use new vocabulary to describe the fruit and to understand that we all have different preferences for food. 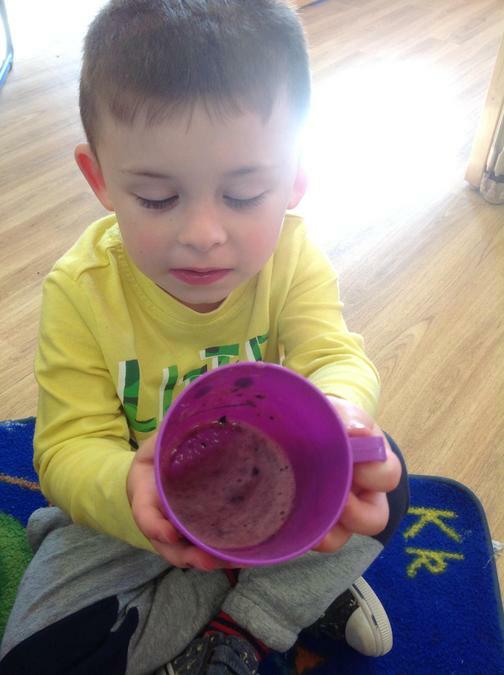 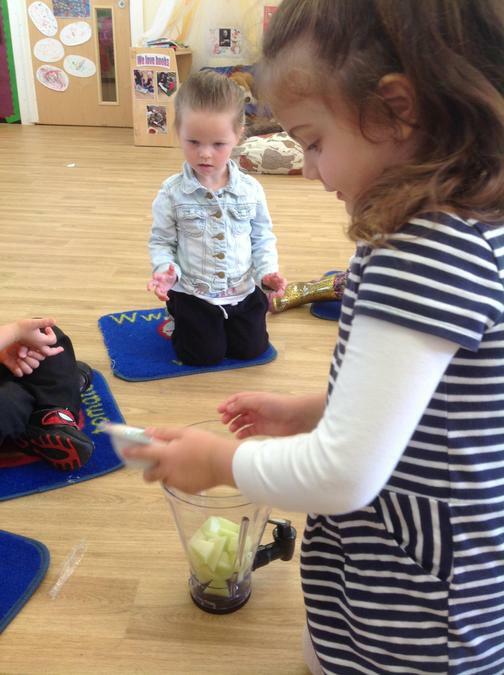 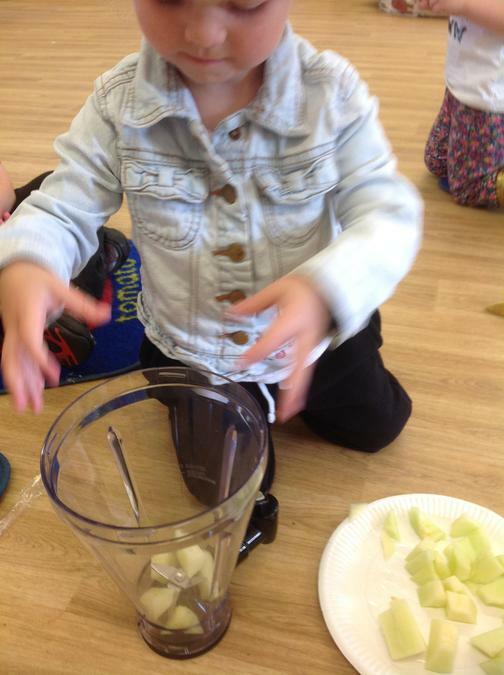 On Friday we choose some of our favourite fruits and combined them to make a smoothie. 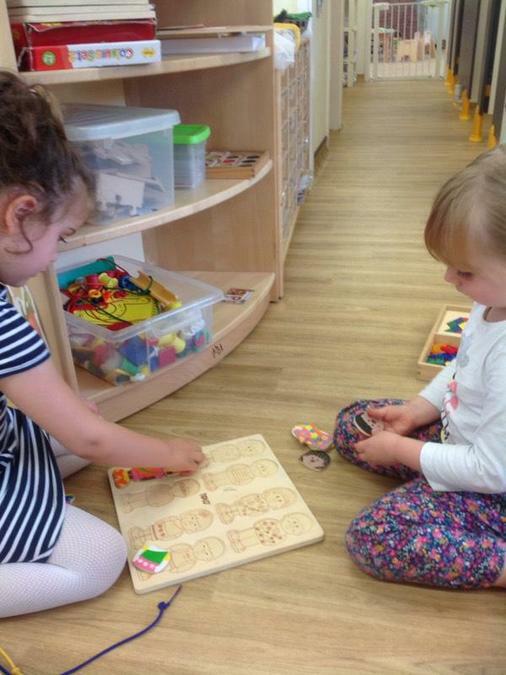 This week the children have continued to develop their friendships and we have been pleased to see them showing co-operation, turn taking, helping each other and enjoying playing alongside each other. 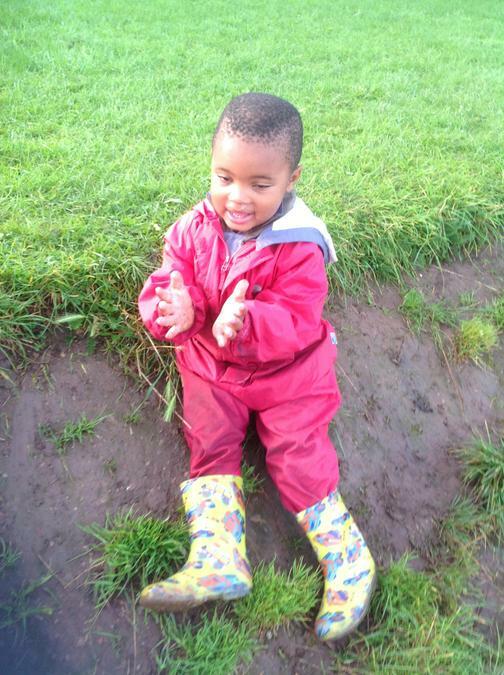 What a wet week it has been. 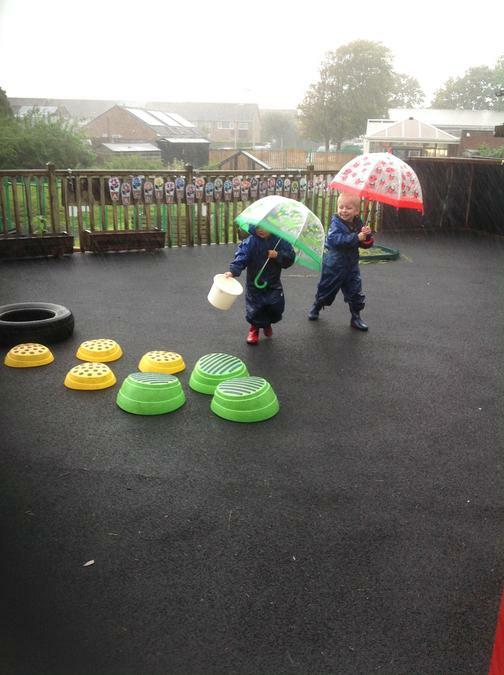 The children have been using the umbrellas while exploring the rain. 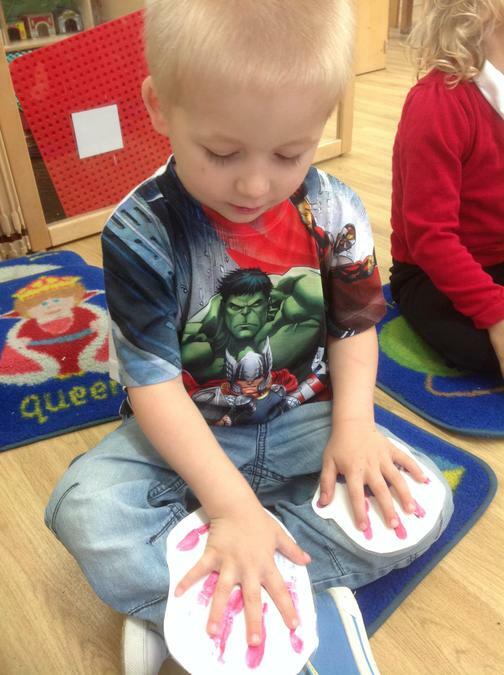 Putting them up and down helps to develop strength and control in their arm and finger muscles. 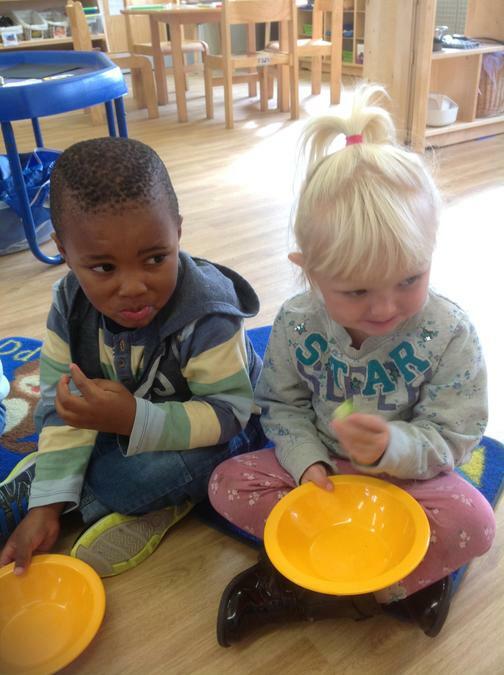 The children have been looking closely at themselves and each other to identify similarities and differences. 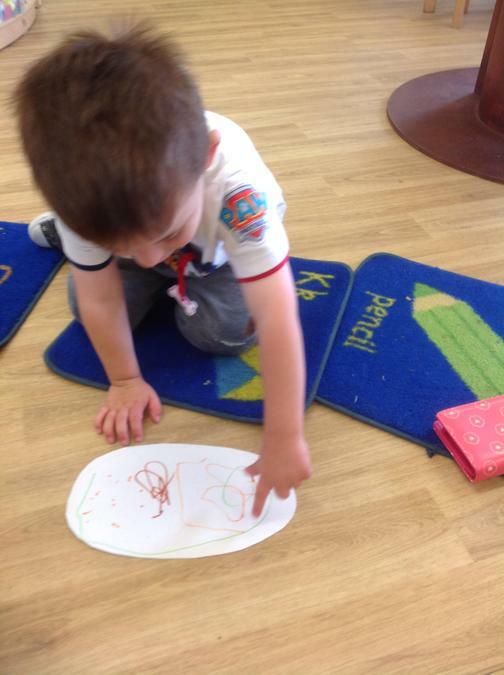 They made hand prints and then compared and talked about the different sizes. 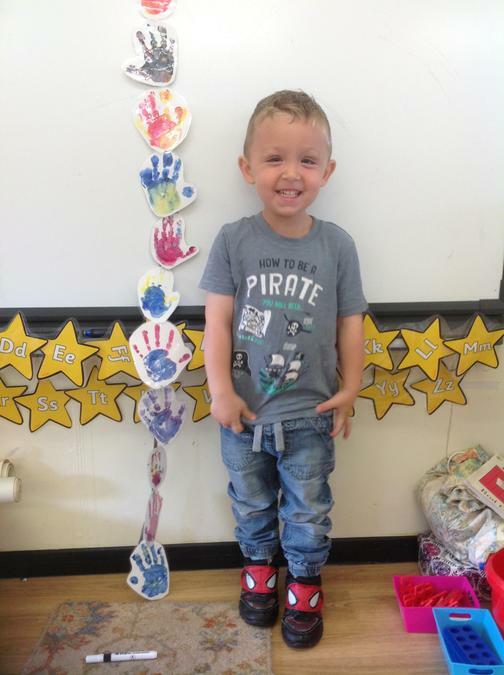 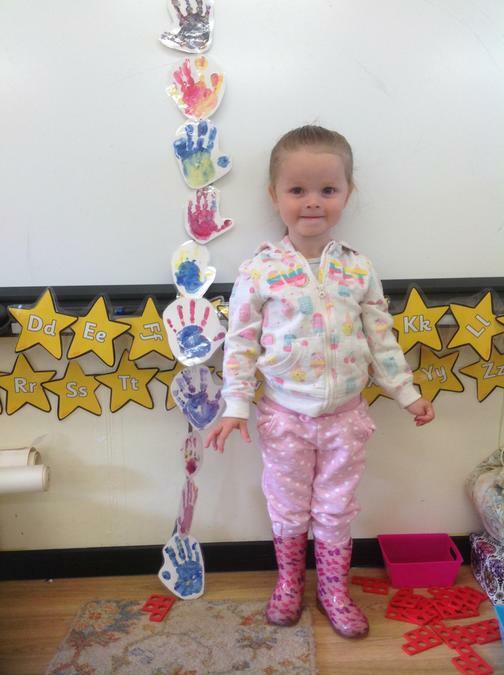 We joined the prints together to make a height chart. 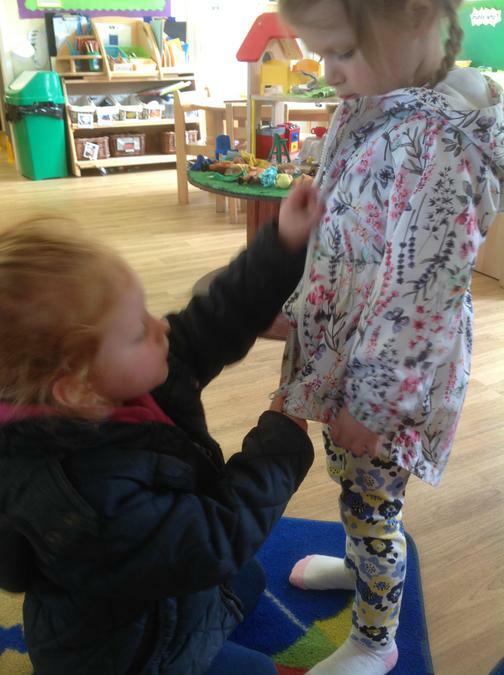 Every child wanted to be measured leading to lots of counting and the use of language to compare heights. 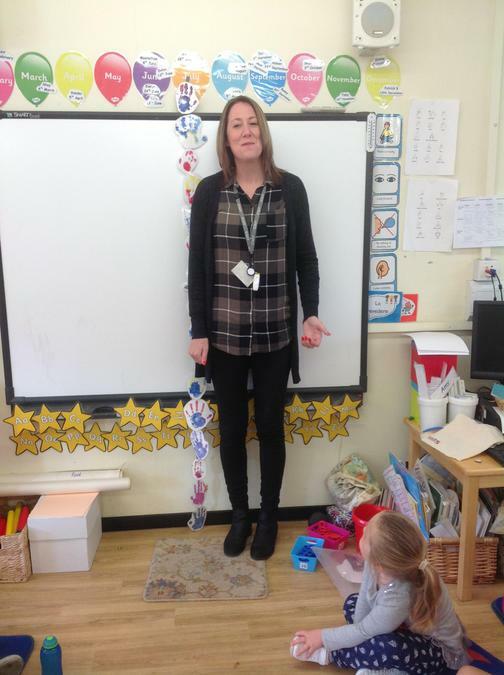 Nobody was as tall as Lisa. 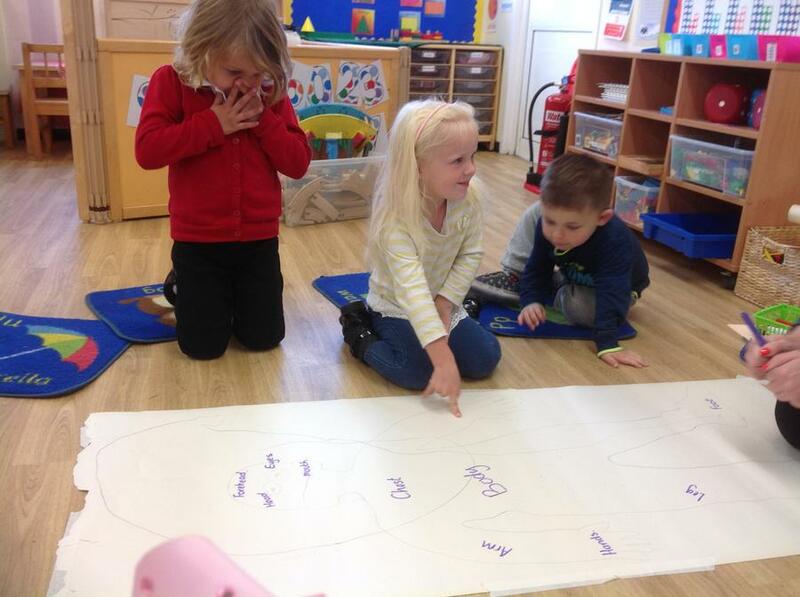 The children thought about the names of all of the body parts that they knew and enjoyed seeing their ideas written on the life size drawings. 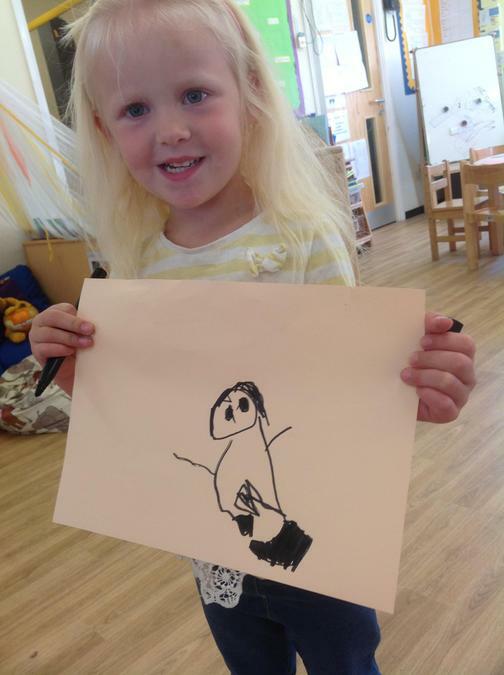 Afterwards they were encouraged to draw their own person, checking that they had included all the parts. 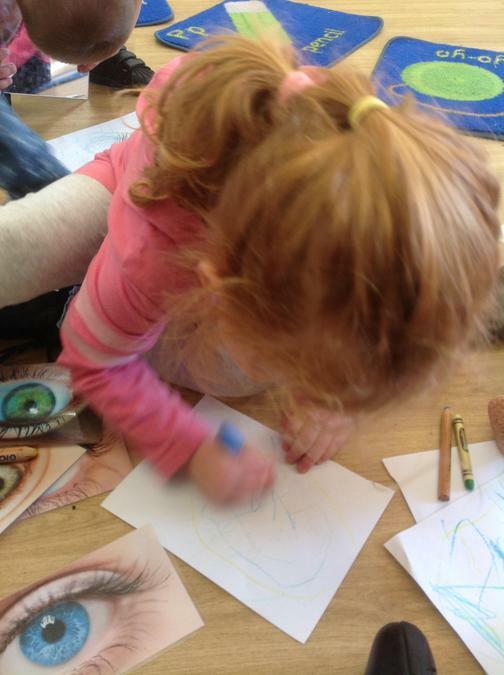 We looked at eye colour and the children were encouraged to make marks to represent their own eyes, looking closely at the shapes they were drawing and the colours that they selected to use. 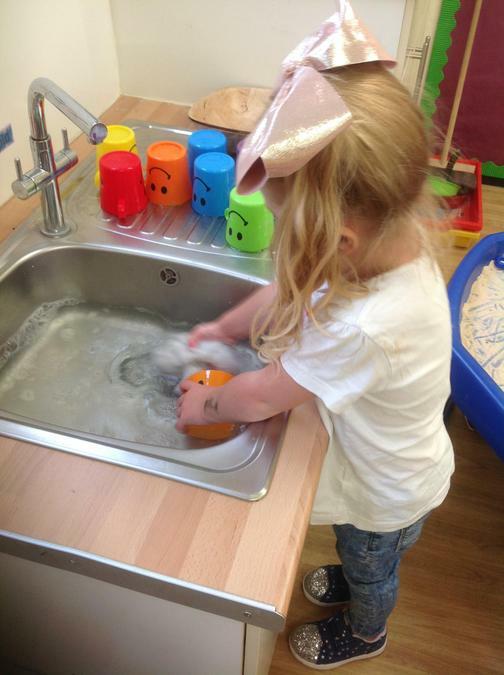 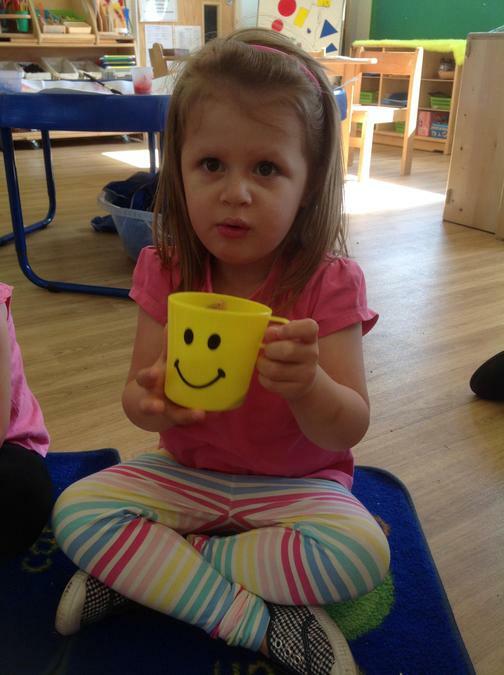 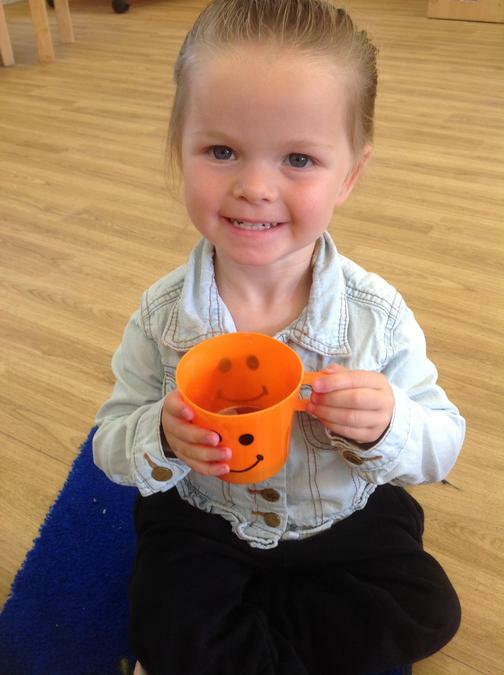 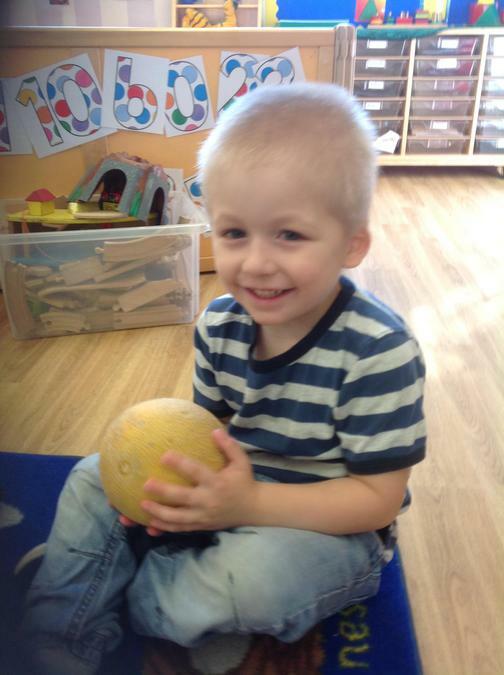 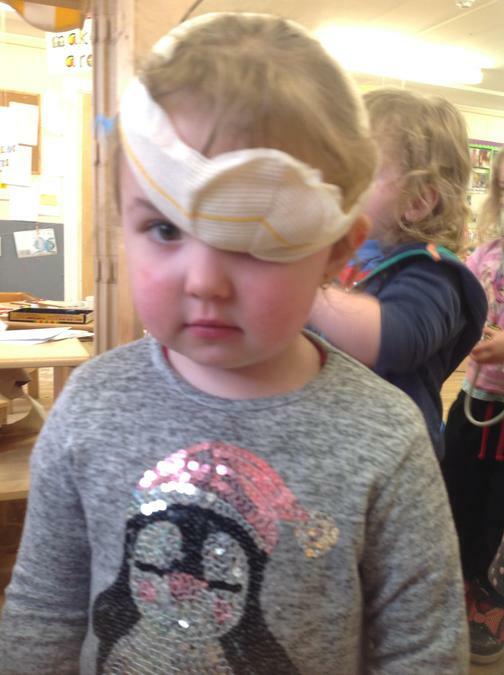 We have been pleased by how well the children have all settled in nursery this week. 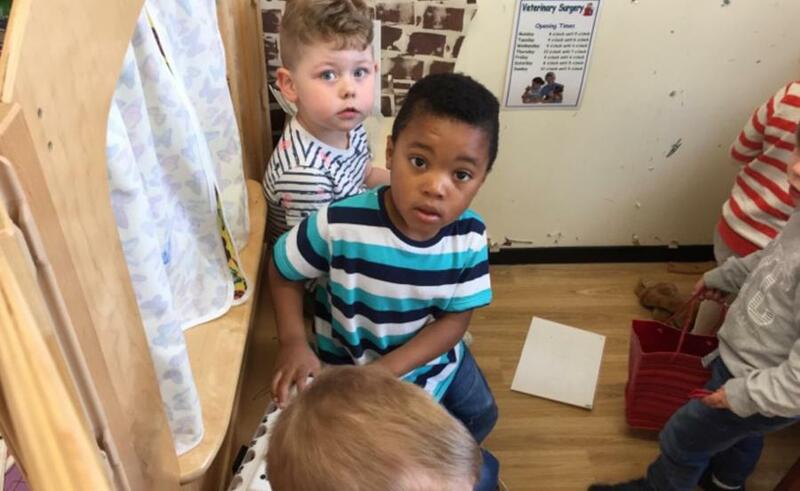 Our 'old' children are enjoying being the 'big' children in the room and our new children are making friends and showing great confidence. 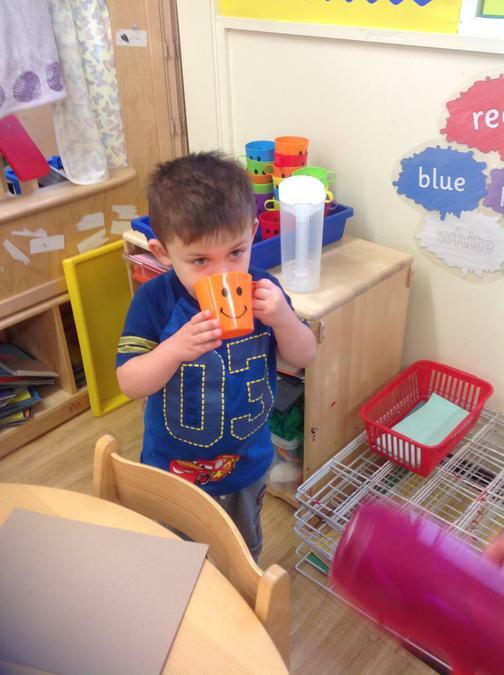 The water bottles have been replaced with cups that the children can fill from a water jug. 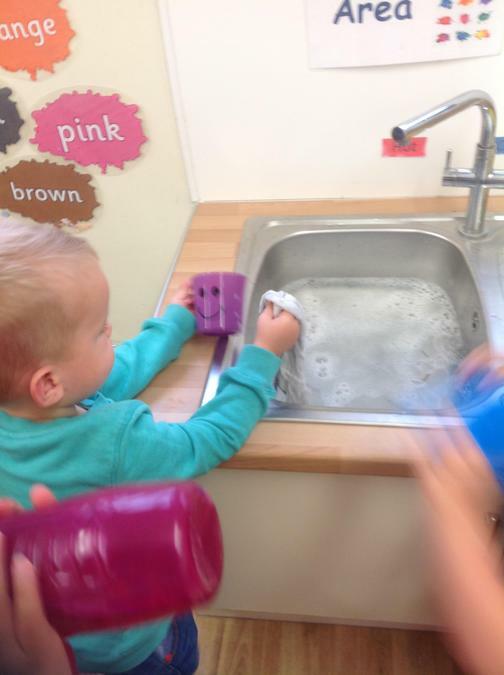 This is proving to be very popular with the children who love the independence of pouring their own drinks and washing up the cups afterwards. 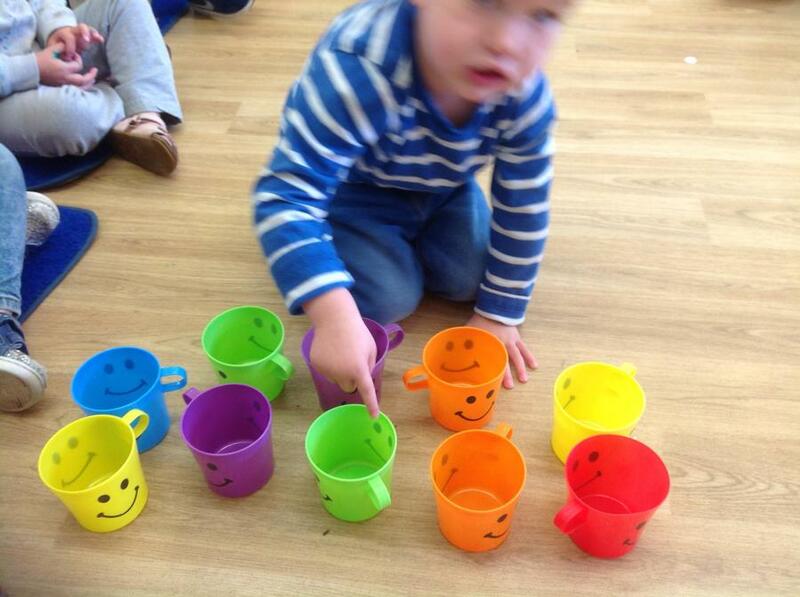 It's great for improving their motor skills too. 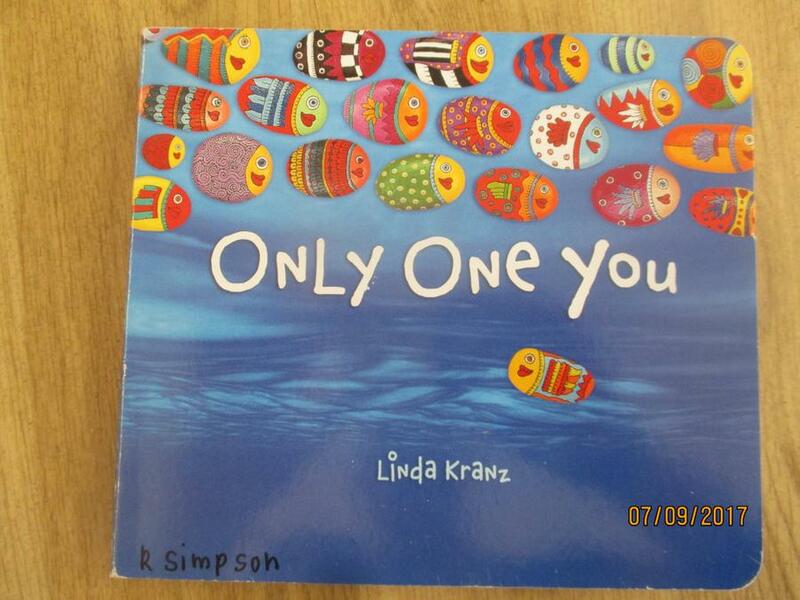 The children have been talking about the patterns and colours on the fish in our 'Only One You' book. 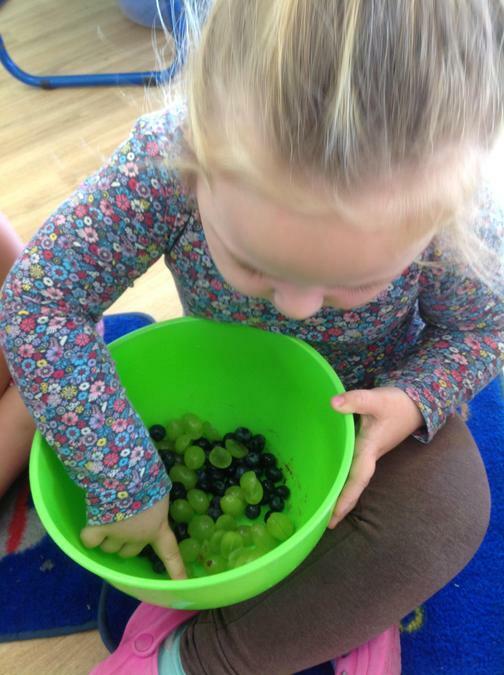 This has inspired some colourful mark making. 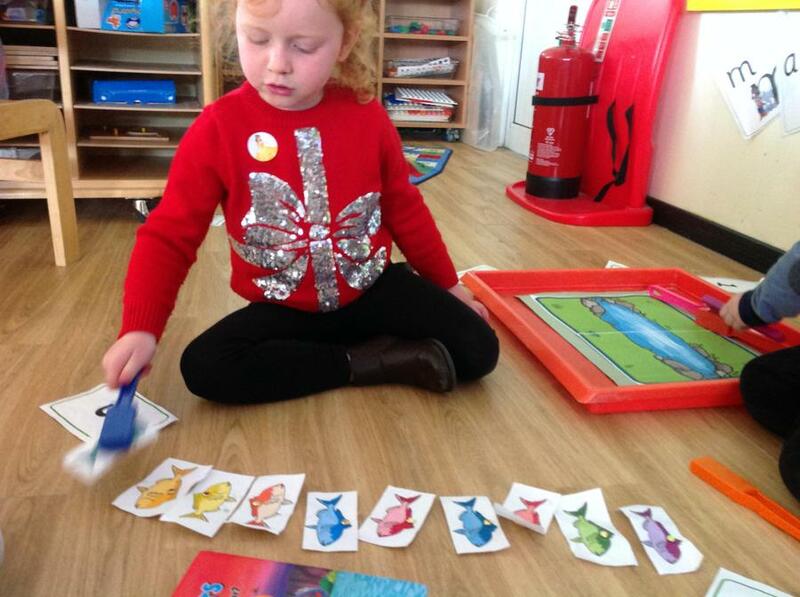 Every child was eager to decorate a paper fish. 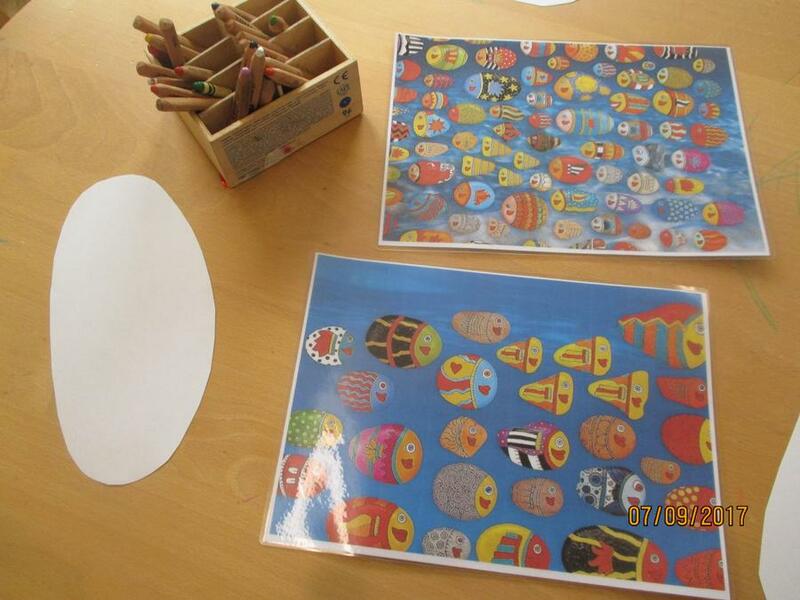 We are now looking forward to painting our pebbles.